I’ve spent the last week on a whirlwind tour of southern California, visiting natural history museums, zoos, and botanic gardens, as well as seeing a fair assortment of marine mammals. Suffice it to say, my (endlessly patient) travel partner Stephanie and I ended the trip with a bit of sensory overload. I had planned to start off with a brief travelogue post and save more thorough analysis for later, but as usual I’ve gone and written much more than I intended. 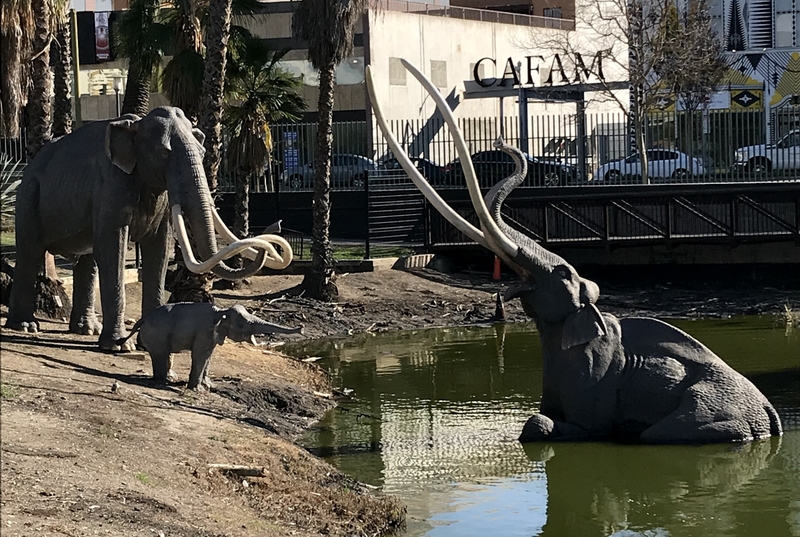 Howard Ball’s famous mammoth statues in La Brea’s lake pit. The La Brea Tar Pits (a.k.a. 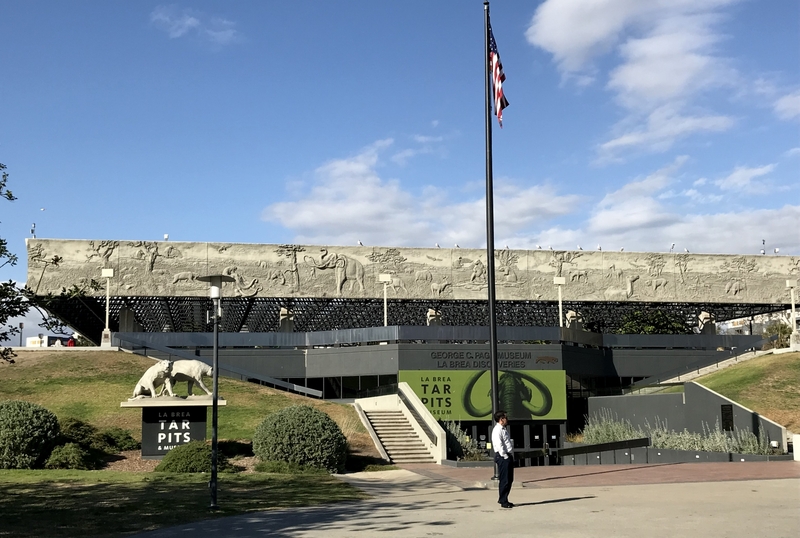 the the tar tar pits) is an iconic fossil locality in downtown Los Angeles. I visited in my single-digit years, but I remember the site better from documentaries like Denver the Last Dinosaur. The region’s asphalt seeps have been known to local people for thousands of years, and they were first commercially mined in the 1700s, when Rancho La Brea was a Mexican land grant. The animal bones commonly found in the asphalt were seen as a nuisance until 1875, when William Denton of Wellesley College identified a large tooth from Rancho La Brea as belonging to an extinct saber-toothed cat. Several years of largely unrestricted fossil collecting followed, until the Hancock family that had come to own the land gave exclusive collecting rights to the Los Angeles County Museum (now the Natural History Museum of Los Angeles County) in 1913. Within two years, museum paleontologists had collected about a million bones, mostly from large Pleistocene animals like mammoths, ground sloths, wolves, and saber-toothed cats. This enormous abundance meant that the La Brea fossils were useful not only as research specimens but as trade goods. 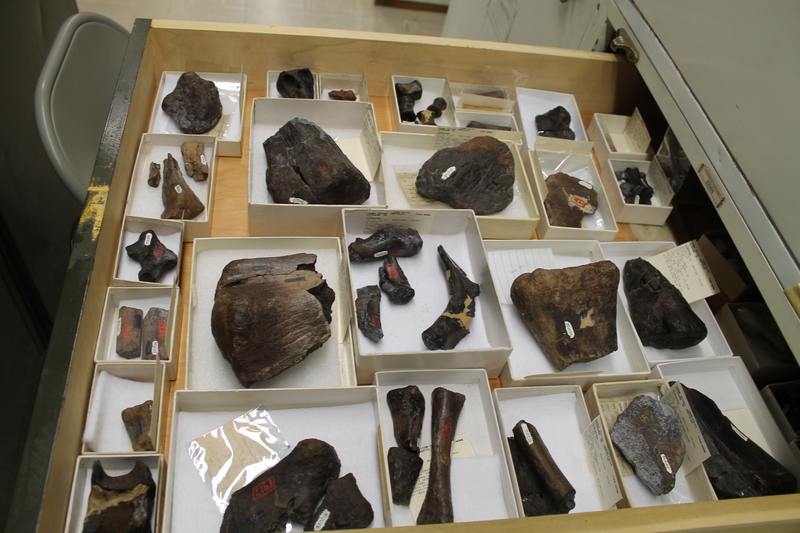 The LACM amassed much of its present-day fossil collection by trading La Brea fossils to other museums. The Hancock family donated the 23 acres around the La Brea asphalt seeps to Los Angeles County in 1924. From that point on, the area functioned as a public park, where visitors could learn about ice age California and even watch ongoing excavations. Park facilities and exhibits expanded gradually over the ensuing decades. Sculptures of bears and ground sloths by Herman Beck were added to the grounds in the late 1920s. In 1952, a concrete bunker over one of the excavation sites became the first La Brea museum. The LACM board commissioned the site’s most iconic display – the trio of mammoth statues – in 1965, and sculptor Howard Ball installed them in 1968. The George C. Page Museum, plus a man who wouldn’t move. Finally, after years of planning and fundraising, the George C. Page Museum of La Brea Discoveries opened in 1977. The remarkable Brutalist building is adorned by a fiberglass frieze depicting ice age animals in a savanna environment. The aluminum frame holding up the frieze also contains an atrium of tropical plants, which the indoor exhibit halls encircle. Architects Willis Fagan and Frank Thornton designed the museum to fit organically into the established park setting, and to subliminally reflect the fossil excavations it celebrates. The building appears to be erupting from the ground, much like the asphalt and the fossils therein. The entrance is below ground level, so visitors must descend a ramp to meet the fossils at their point of origin. The giant camel Camelops hesternus (front) with adult and juvenile mastodons (back). Those logs were also hauled out of the asphalt seeps. Panthera atrox was apparently more like a giant jaguar than a lion. Small-by-comparison Smilodon fatalis in the back. In many ways, the Page Museum is now a museum of a museum. Most of the interior exhibits, including the fossil mounts designed by Eugene Fisher*, are the same as they were in 1977. Photos show that the exhibit halls, prep labs, and collections areas have changed little in the last 40 years. And that’s okay! The museum building and the outdoor displays around it have been part of the Los Angeles landscape for decades, and cherished by generations of visitors. To the museum’s credit, the 1970s exhibits were well ahead of their time. Windows onto the prep lab and collections would be right at home in modern “inside out” museums, and an oft-repeated message that microfossils (such as insects, birds, rodents, and pollen) are more informative than megafauna fossils vis-à-vis paleoclimate and ancient environments is still very relevant to the field of paleontology today. That isn’t to say there is nothing new to see. Newer signage around the park grounds does an excellent job re-interpreting older displays, especially those that are now considered inaccurate. For example, Howard Ball’s mammoth statues are probably among the most photographed paleoart installations in the world, but they completely misrepresent the way most of the animals found at La Brea actually died. Ball’s female mammoth is hip-deep in a man-made lake filling in an old asphalt quarry. As the signage (and tireless tour guides) explains, the animals trapped here thousands of years ago actually became stuck in asphalt seeps that were six inches deep or less. Meanwhile, while the classic friezes and murals throughout the Page Museum depict savanna-like landscapes, more recent analysis of microfossils demonstrates that the area was actually a fairly dense woodland. 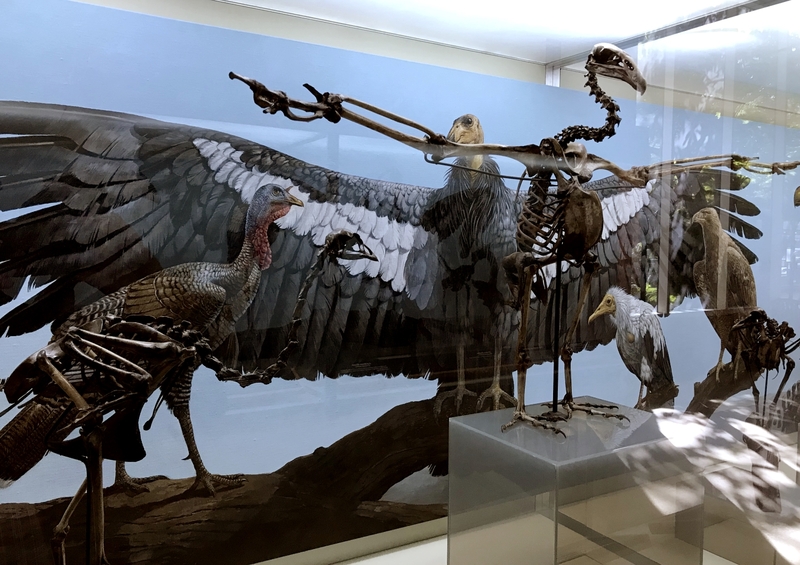 Turkeys, condors, eagles, and storks are among the more unusual fossil mounts at the Page Museum. There are two main reasons that the Page Museum is a must-see. First, it provides an in-depth view of a single prehistoric ecosystem. 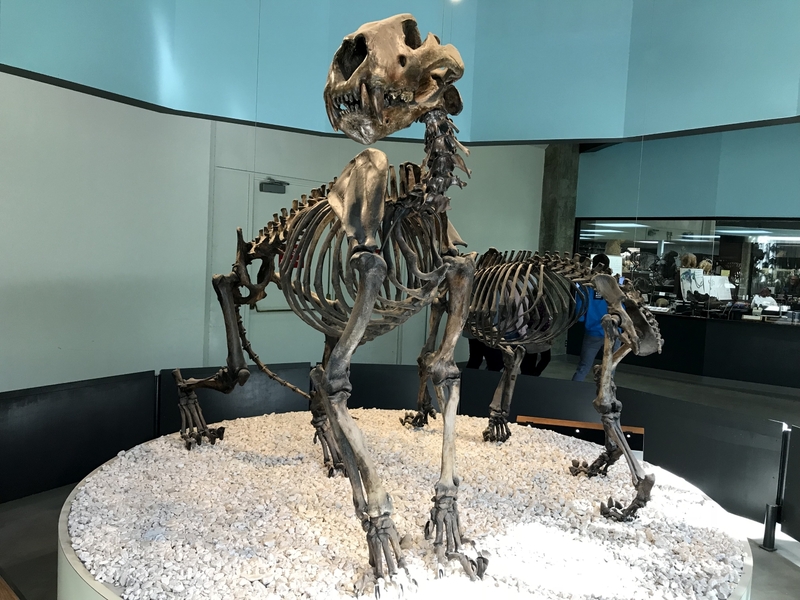 As mentioned, LACM traded La Brea fossils to all sorts of other museums, so chances are you’ve already seen a La Brea Smilodon, Paramylodon, or dire wolf. The Page Museum has these animals, but it also has rarely-seen creatures like ice age turkeys, condors, and coyotes. I counted 25 mounted skeletons in total, to say nothing of the hundreds of smaller specimens. My favorite display was a Smilodon skull growth series, where you can see how the adult saber teeth erupt and push out the baby sabers. 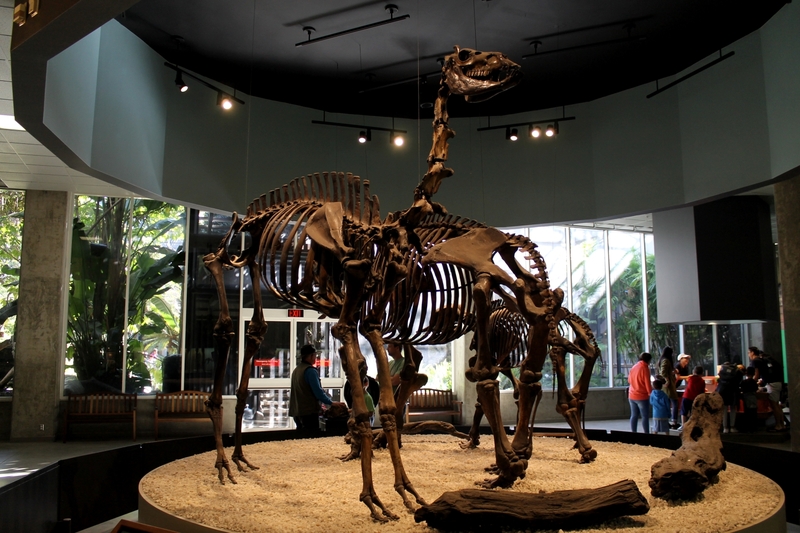 In addition, the Page Museum stands right next to the La Brea fossil quarries, past and present. The museum and the park that preceded it were conceived as places where the public could see science in action. Researchers have been uncovering fossils at La Brea for over a hundred years, and visitors have been watching over their shoulders the entire time. That alone makes La Brea a very special place. *All the La Brea mounts (at the Page Museum or elsewhere) are composites. To my knowledge no articulated remains have ever been recovered from the asphalt seeps. As Stephanie pointed out, the skull of the Equus occidentalis mount actually belonged to a significantly younger animal than the mandible. 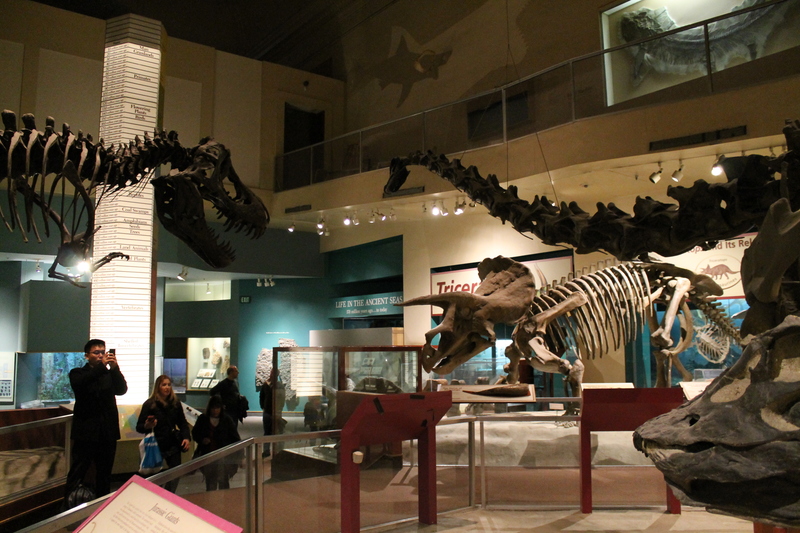 This Tyrannosaurus growth series is the centerpiece of the LACM Dinosaur Hall. Our next stop was the Page Museum’s parent institution, the Natural History Museum of Los Angeles County (which I will continue to abbreviate as LACM for consistency). 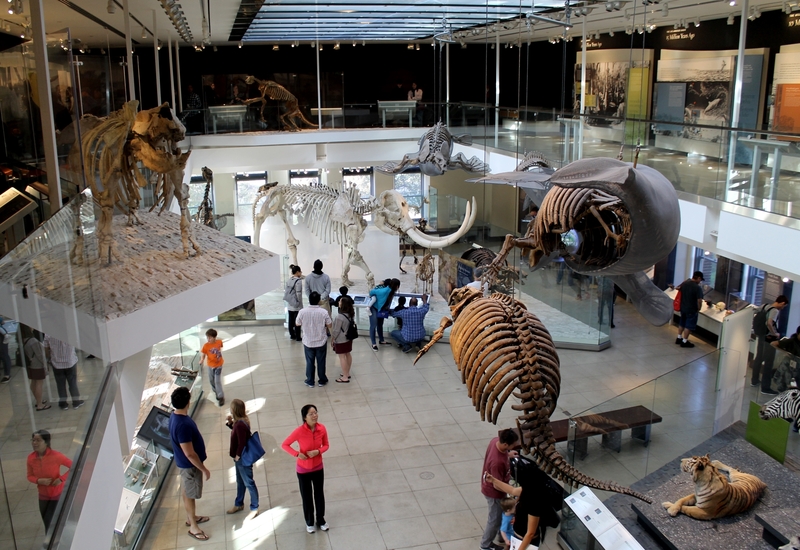 LACM actually features two fossil exhibits: the 2010 Age of Mammals Hall and the 2011 Dinosaur Hall. Both were part of a $135 million project to restore and update much of the LACM building, which first opened in 1913. While the two halls were developed concurrently by different teams, they are architecturally very similar. Parallel mezzanines flank spacious central aisles, which maximizes usable space in the two-story rooms and allows visitors to view most of the mounted skeletons from ground level or from above. 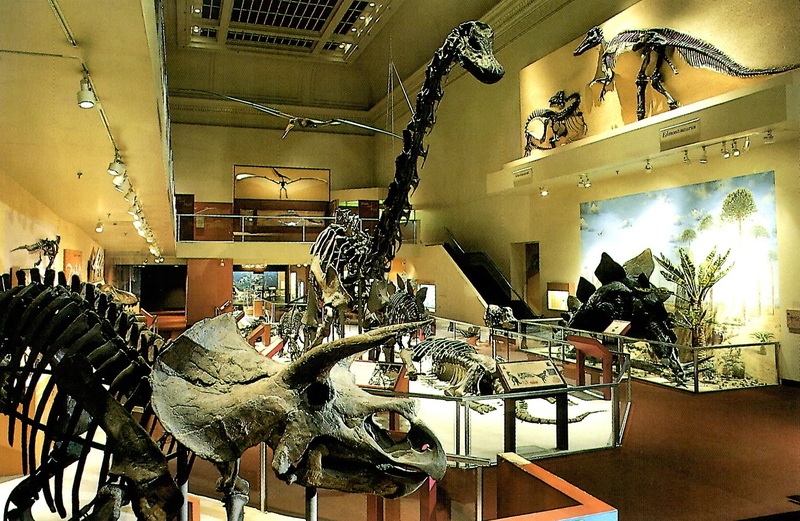 The primary strength of both the Age of Mammals Hall and the Dinosaur Hall is that they look really good. New skylights and newly uncovered bay windows yield plenty of natural light. 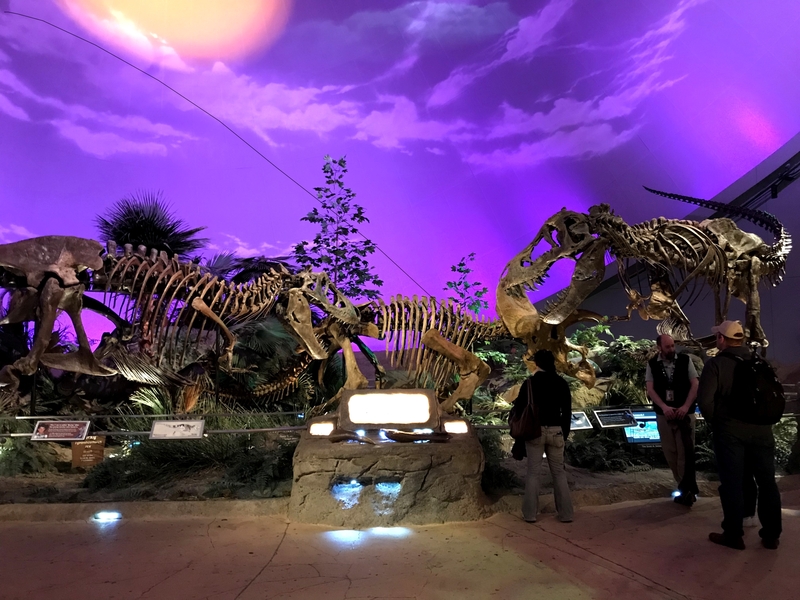 Primary-colored panels provide interesting backdrops for the specimens, and fossil mounts on the ground and in the air keep visitors looking in all directions. These exhibits were clearly designed to look incredible from the moment you enter the room, and the abundant natural light means they photograph quite well. Suspended skeletons make use of the vertical space and keep visitors looking all around the exhibit. Triceratops and Mamenchisaurus at the front end of the Dinosaur Hall. 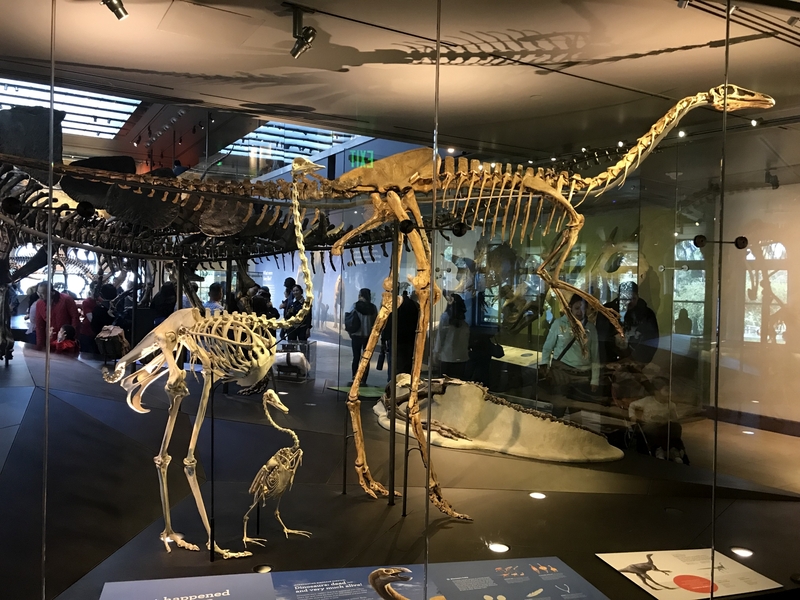 LACM’s mammal collection has been built up over the last century, while the dinosaur specimens were mostly collected by Luis Chiappe’s Dinosaur Institute in the decade preceding the exhibit’s opening. Nevertheless, both exhibits feature an uncommon diversity of beautifully-prepared fossils. I was particularly taken by the metal fixtures constructed to display incomplete skulls of Augustynolophus and Tyrannosaurus. The mounted skeletons were handled by two different companies: Research Casting International did the mammals and Phil Fraley Productions did the dinosaurs. I actually like the mammal mounts slightly better. There’s a greater range of interesting poses, and they don’t suffer from Fraley’s signature exploding chests. The Poebrotherium, Hoplophoneus, and Hyracodon mounts are full of life and character. A metalwork frame artfully shows the missing parts of this Augustynolophus skull. All that said, there is a surprising divergence in the quality of interpretation between the Age of Mammals Hall and the Dinosaur Hall. On this front, the Age of Mammals Hall is better by far. 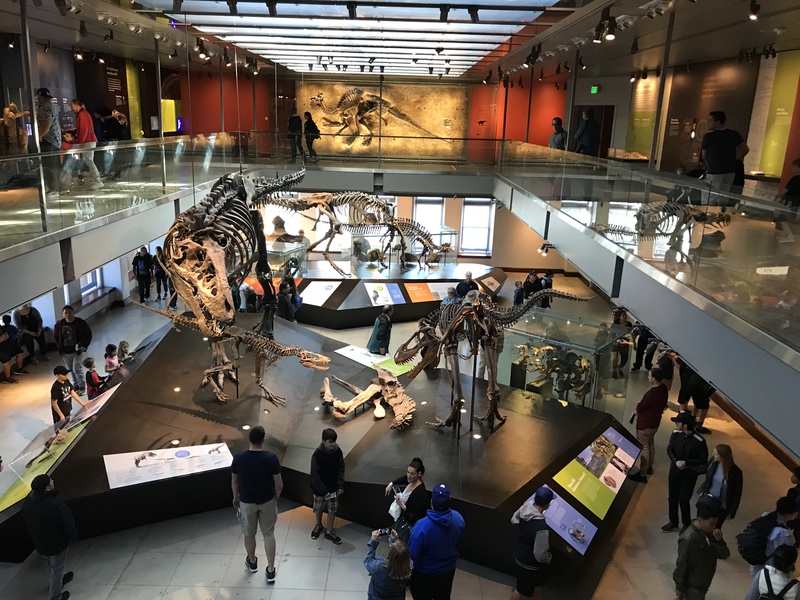 There is an open floor plan that visitors can circulate freely, but everything comes back to three main ideas posted near the entrance: continents move, climates change, mammals evolve. In no particular order, the exhibit demonstrates how Cenozoic mammals diversified in response to the environmental upheaval around them. 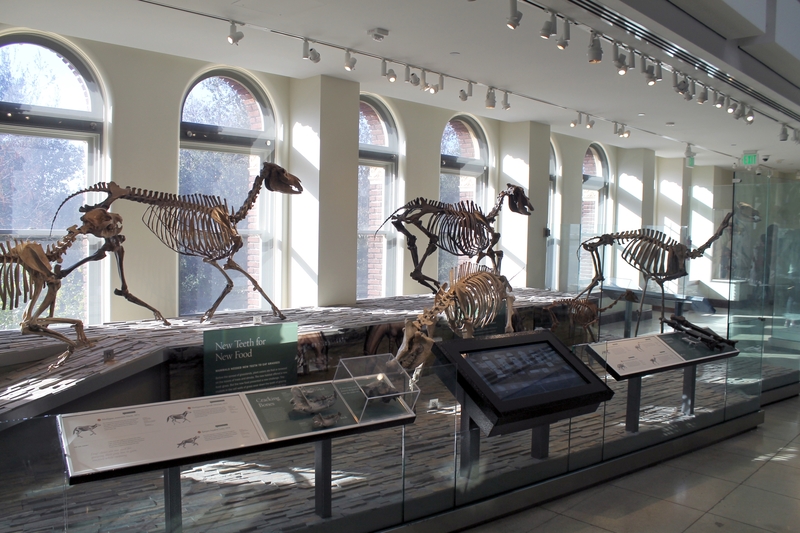 On the ground floor, one tableau shows how dogs, horses, rhinos, and camels evolved to move swiftly across the emergent grasslands of the Miocene. Another area covers how mammals grew larger to adapt to an ice age climate. Overhead, a whale, sea cow, sea lion, and desmostylian illustrate four independent lineages that evolved to make use of marine resources. 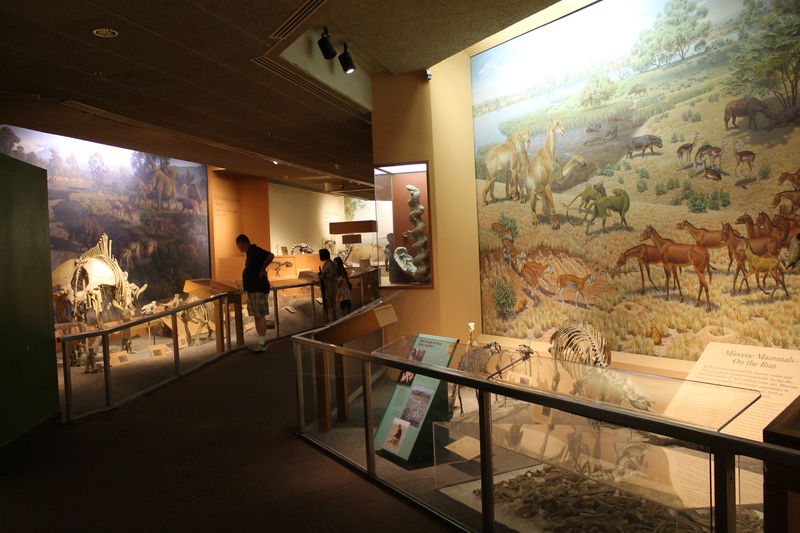 Exhibits on the mezzanine level focus on how paleontologists learn about prehistoric mammals. One area compares different sorts of teeth and feet. Another explains how pollen assemblages can be used to determine the average temperature and moisture of a particular time and place, while drill cores illustrate how a region’s environment changed over time. Although the exhibit as a whole has no time axis, it does an excellent job conveying how evolution works at an environmental scale. The addition of dogs, camels, and rhinos makes for an informative twist on the classic horse evolution exhibit. Struthiomimus is accompanied by a modern ostrich and tundra swan. By comparison, the Dinosaur Hall doesn’t have any obvious guiding themes. The exhibit is a grab-bag of topics, and to my eyes, specimens and labels appear to be placed wherever they fit. Jurassic Allosaurus and Stegosaurus are surrounded by displays about the end-Cretaceous extinction. Carnotaurus of Cretaceous Argentina is paired with Camptosaurus of Jurassic Colorado. Mamenchisaurus shares a platform with distantly-related Thescelosaurus, which lived 80 million years later on the other side of the world. An explanation of what defines a dinosaur is confusingly juxtaposed with non-dinosaurian marine reptiles. If there’s any logic here, I didn’t see it. This is accentuated by the fact that the label copy is no more specific than a run-of-the-mill dinosaur book for kids. It all feels very generalized and unambitious, especially compared to the Age of Mammals Hall. I would have liked to see more information on what makes these particular specimens special, as well as how they were found, prepared, and interpreted. I suppose it’s up to the visitor whether an exhibit like this can get by on looks alone. And so concludes day one of our trip. Next time, the Raymond M. Alf Museum and places south! Tyrannosaurus and Triceratops skeletons look particularly cool against a purple backdrop. The Children’s Museum of Indianapolis (TCM) is one of the best museums in the United States, particularly for paleontology. That may sound surprising for those unfamiliar with the museum. A typical children’s museum serves an important function by providing young people an opportunity to create and explore, but their exhibits usually amount to glorified playgrounds. Despite its name, TCM is something else entirely. Founded in 1925 and growing by leaps and bounds ever since, TCM is a bona fide research institution. Numerous staff curators oversee a growing collection of historical, anthropological, and natural science objects that are regularly studied by visiting researchers. TCM’s dinosaur holdings are particularly impressive, including the Dracorex hogwartsi holotype and the first Tyrannosaurus found with its furcula (wishbone) intact. The museum’s paleontologists collect new specimens from the field every year. Other highlights include a collection of 50,000 historic toys from 120 countries, 2,500 traditional garments and textiles from around the world, and hundreds of original paintings and sculptures of prehistoric creatures donated by John Lazendorf. In 1976, TCM joined forces with Purdue University to excavate this mastodon in Greenfield, Indiana. The exhibits at TCM include objects that are as fascinating and unique as those on display at any top tier history or science museum. And unlike typical children’s museums, TCM’s exhibits aren’t pitched exclusively at children but at families learning together. It sounds like a subtle distinction, but the effects are profound. Interactivity in one form or another is generally seen as critical to children’s learning in a museum context. However, all opportunities for interaction are not made equal, and “free choice” interactivity (such as pressing buttons and turning cranks) is increasingly seen as an ineffectual teaching tool. Educators and exhibit designers have found far more success with “scaffolding,” which is the practice of creating exhibits that are simultaneously pitched to multiple audiences. Scaffolded exhibits might include content for different age levels, or for visitors with passing familiarity with a topic as well as those with deep knowledge. At TCM, scaffolding is used to coach parents and guardians to effectively guide children’s investigations. Wherever there is a display that is sure to attract kids’ attention, there is signage nearby to help parents ask open-ended questions, direct attention to a particular aspect of the exhibit, prompt hypotheses, or suggest connections to personal experiences. In this way, the scaffolded exhibits channel a positive educational experience for children through a trusted and familiar source of information (their parents). This also means that there’s no letting kids loose in an exhibit as though it were a playpen. Parents and guardians are given the tools they need to participate in their children’s learning process, and probably learn something interesting for themselves along the way. Even for adults with more independent children in tow (or traveling alone!) there’s plenty to see and do. Indeed, the effort to provide quiet, contemplative experiences alongside more participatory ones is one of the most commendable aspects of the TCM exhibits. Visitors can view Dale Chiuly’s five-story blown glass sculpture, Fireworks of Glass. In the archaeology lab, they can watch conservation specialists restore artifacts collected from shipwrecks off the coast of the Dominican Republic. If they so choose, visitors can even grapple with the challenging themes presented in “The Power of Children,” an exhibit that highlights the accomplishments of children that stood up against disease, institutionalized racism, and genocide. Gorgosaurus, Maiasaura, and Bambiraptor populate one of the main tableaus in DinoSphere. 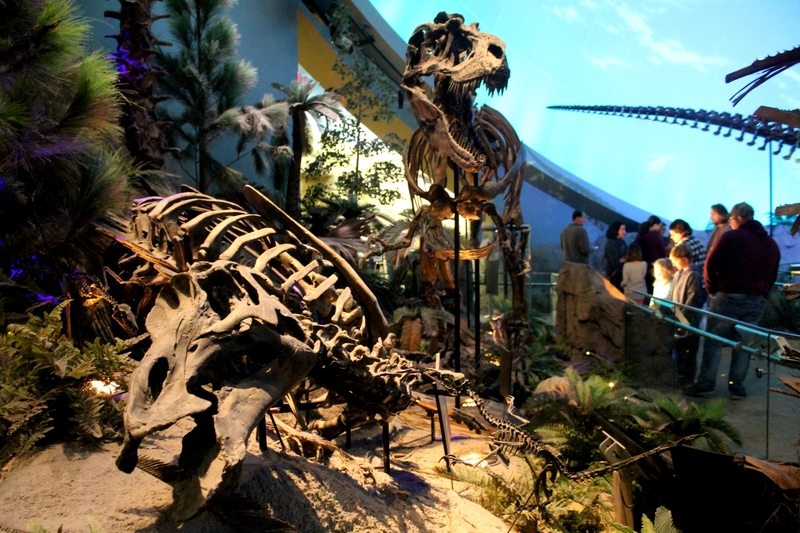 All the best that TCM has to offer is on display in the epic paleontology exhibit, DinoSphere. The peculiar name references the fact that the exhibit occupies a globe-shaped addition to the main building that once held an Imax theater. Rather than removing the giant screen and fancy audio system, they’ve been put to use in creating a uniquely immersive experience. A series of vivid skyscapes is projected over a 22-minute cycle: a red sunrise fades into cobalt tones at midday and a deep purple at night. This is supplemented by a chorus of bird and insect sounds, and certain corners of the exhibit smell of cedar and magnolia (this isn’t the only place where scents are used – at one particularly inspired station, visitors can sniff a duckbilled dinosaur, which smells like cross between a cow and bottom of a birdcage). Impressive as these elements are, DinoSphere is more than a special effects show. More than twenty complete skeletons of Cretaceous animals are on display, including ten real dinosaur mounts. For those keeping track, that’s as many as are in the Smithsonian and the Field Museum exhibits combined. Sourced primarily from the commercial market (including the Black Hills Institute, which also constructed the mounts)*, many of these specimens are truly unique. There’s Leonardo, a Brachylophosaurus preserved with large areas of skin and muscle impressions, and the most complete Gorgosaurus yet found, which has a visible brain tumor among many other fascinating lesions and maladies. *Yes, this isn’t 100% ideal. But at least the specimens are in a publicly accessible collection now. 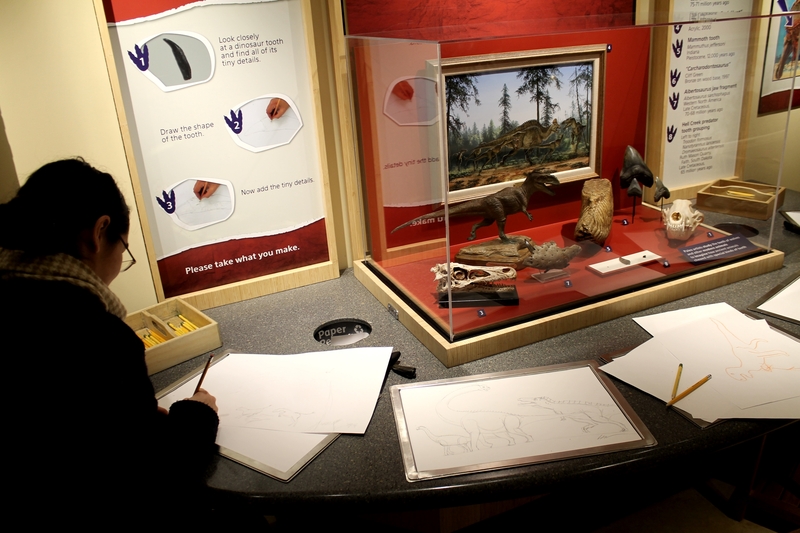 Original fossils and artwork by Michael Skrepnick and Cliff Green are offered as inspiration at this drawing station. True to form, there are many opportunities for participation in the DinoSphere. For one thing, the exhibit strongly encourages exploration. A cursory walk through the gallery is not enough to get the total experience. You have to look high and low and occasionally behind doors to find all the specimens on display. For example, there’s a Didelphodon jaw in a burrow close to the base of the Tyrannosaurus and Triceratops tableau. For visitors that respond better to a more personal connection, some rather gifted interpreters are on continuous patrol. When we visited TCM in December, I was fortunate enough to watch Mookie Harris in action. He has a great repertoire with toddlers, but was just as happy to dive into more complex concepts with older children and adults. Then there’s the dinosaur art gallery. Away from the noise and bustle of the DinoSphere proper, visitors can view samples from the Lazendorf collection in a quiet, contemplative setting (David at Love in the Time of Chasmosaurs got a behind-the-scenes look at the rest of the collection – check out his photos and the rest of his TCM posts). Scaffolded signage encourages families to view the artwork with a critical eye, comparing the illustrated and sculpted dinosaurs to original fossils and separating rigorous reconstruction from artistic interpretation. There are also plenty of drawing stations, complete with prompts and sample artwork for inspiration. The whole gallery is a wonderful way to introduce visitors to the blurred lines between art and science, and I’ve never seen anything quite like it. Fun fact: I prepped a couple of the tail vertebrae in this Hypacrosaurus mount during a brief but inspiring “internship” when I was 13. To sum up, if you’re looking for world-class fossil exhibits, don’t limit yourself to the big acronyms (AMNH, FMNH, and so forth). You might want to wait a couple years, though. During our visit, we were graciously invited into the fossil prep lab, where Curator William Ripley filled us in on the museum’s future plans. It rhymes with “Triassic expansion” and the TCM paleontology team is currently collecting new skeletons from a quarry in Wyoming. Can’t wait! Andre, L., Durksen, T., and Volman, M.L. 2016. Museums as avenues of learning for children: a decade of research. Learning Environments Research 20: 1: 47-76. Lincoln, Nebraska is home to a legendary giant. 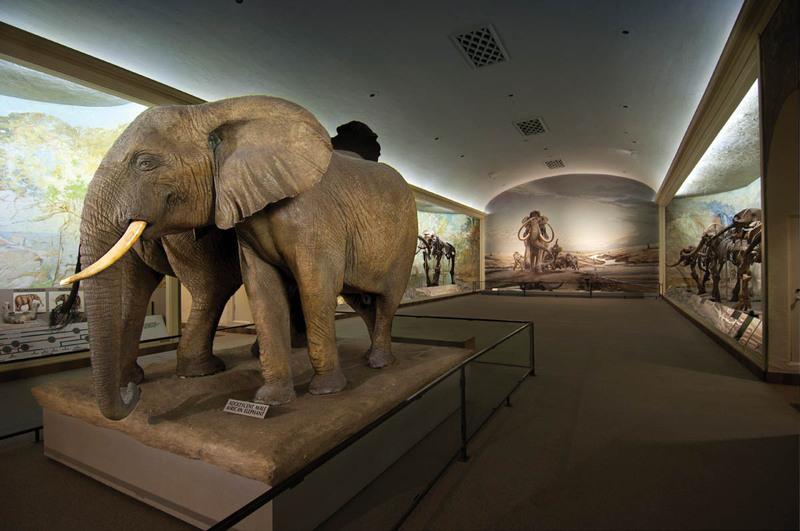 The University of Nebraska State Museum, known locally as Morrill Hall or Elephant Hall, has the largest mammoth skeleton on display anywhere in the world. “Archie” the columbian mammoth is literally a giant among giants. 14 feet tall and striding on bizarre, stilt-like legs, he towers over the twelve other extinct and extant proboscidians (ten skeletons and two taxidermy mounts) in the museum’s great hall. Like the Field Museum’s Sue the Tyrannosaurus, Archie is not only a scientific specimen, but something of a mascot. 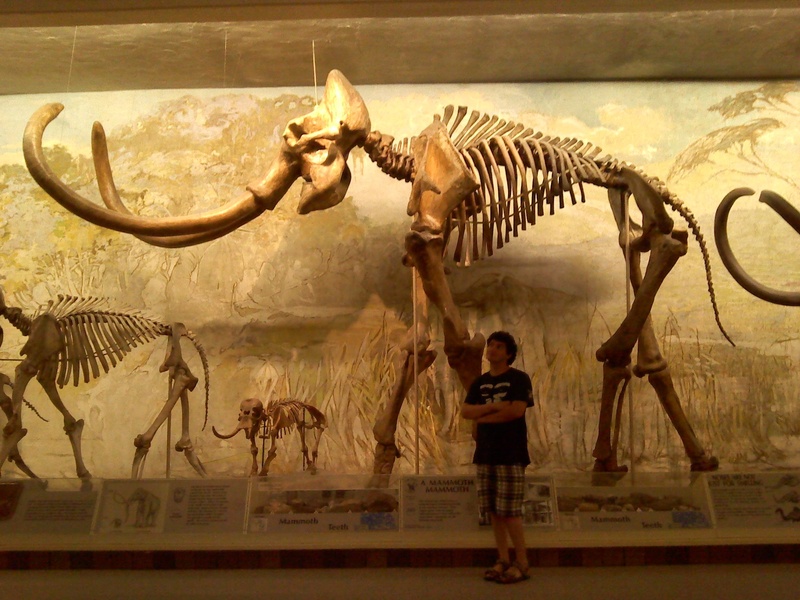 The mammoth is regularly cited as the museum’s star attraction. Its image adorns museum merchandise, and a dancing costumed Archie shows up at local schools and on game days. A bronze sculpture of a fur and flesh Archie created by local artist Fred Hoppe was placed outside the museum’s entrance in 2006, and it is apparently traditional for students to slap its outstretched forefoot for luck. At the center of it all, though, is the real mounted skeleton, which has been on display for 84 years and admired by generations of visitors. Archie’s skeleton was famously discovered by chickens. In 1921, southwest Nebraska farmer Henry Kariger noticed that his chickens were pecking at some white minerals eroding out of a hillside. Thinking the substance would be a good source of lime for his flock, Kariger started collecting it and adding it to their feed. Eventually the hill eroded further, and Kariger realized he had something more impressive than lime deposits – it was the jaws and teeth of a giant animal. Barbour typically received dozens of letters about fossil finds every year, and he gave Kariger the same instructions he gave everyone else: avoid handling the fossils, and absolutely refrain from attempting to extract more bones from the ground. Barbour had seen countless fossils destroyed by overeager members of the public trying to pry them out by hand, or with crowbars. He informed Kariger that the museum would pay for an important find, but only if it was kept intact. Barbour requested that Kariger leave the fossils until the spring, when a museum crew could come out and assess them. Archie the mammoth in 2010, with the author looking characteristically ridiculous. Barbour soon discovered that Kariger had contacted a number of other museums, shopping his find around in an effort to get the best price. In a letter, Kariger informed Barbour that he had been told he had a giant sloth, and that it was exceptionally rare. Barbour held firm, repeating that the find was certainly a mammoth and that he could look at it in the spring. Apparently impatient, Kariger decided to ignore Barbour and got to work excavating the rest of the skeleton, hauling the bones out of the hillside with a team of horses. Miraculously, Kariger did not completely destroy the fossils in the process. 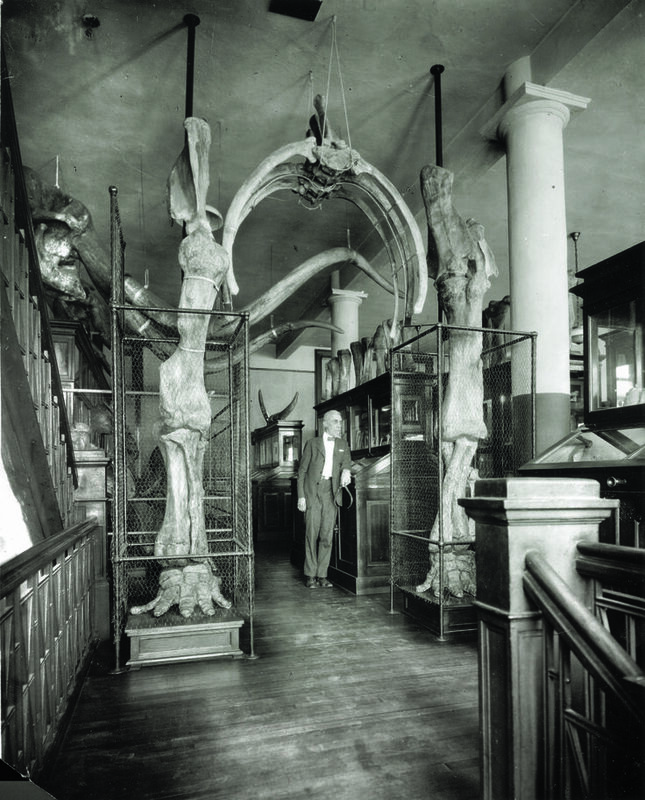 With a good portion of a mammoth skeleton in his possession, Kariger brought his find to Lincoln the following summer to display it at the state fair. It was here that Barbour met Kariger – and his mammoth – for the first time. Barbour was suitably impressed, and immediately wrote to Henry Osborn of the American Museum of Natural History, describing the skeleton as complete save for its tusks and the lower portions of its limbs. According to an account by Walter Linnemeyer (who was about six years old at the time), local authorities discovered that Kariger was selling bootlegged whiskey out of the back of his tent at the state fair, and confiscated both the whiskey and the fossils. Although this makes for an exciting story, Vertebrate Paleontology Collections Manager George Corner confirms that the skeleton “was not confiscated by the Museum or anyone else and then given to the Museum.” In fact, documents in the museum archives confirm that Barbour paid Kariger $250 for the fossils, and that the entirely amicable transfer occurred at the fair in 1922. Since no other documentation about Kariger being involved in illicit sales has surfaced, we must assume that the story is, as Corner puts it, “a product of the times.” Prohibition was the law of the land in 1922, and rumors about sources of illegal liquor must have been common. One might also speculate that anti-government sentiments in rural communities may have played a role in the myth-making. Another reason to discount the notion that Kariger’s fossils were seized is that he and Barbour maintained a friendly relationship for years afterward. In December 1922, Kariger wrote to Barbour to inform him that he had found one of the missing tusks, but that he had damaged it while removing it from the ground (it didn’t help that his pigs had chewed on it a bit). Barbour once again asked that Kariger leave any further finds buried, reminding him that the museum would pay more for undamaged fossils. Barbour and his student William Hall made the two-day journey to Kariger’s farm the following June. They stayed with the Kariger family for five nights, paying them for room and board, as well as the services of a draft team. Even after resorting to dynamite to blast away the rest of the hill, Barbour went back to Lincoln empty handed. Still, both he and the Karigers enjoyed the experience, and they fondly reminisced about the trip in subsequent letters. Barbour initially published the Kariger mammoth as a new species, Elephas maibeni, after museum donor Hector Maiben. Osborn’s monograph on proboscidian evolution, posthumously published in 1936, redescribed it as Archidiskodon imperator (hence “Archie”). Archidiskodon has since been folded into Mammuthus columbi, or the columbian mammoth, a species which ranged throughout the western United States and Central America. When the University of Nebraska State Museum acquired Archie in 1922, space was severely limited. Collections were already stuffed into attics, cellars, and even the steam tunnels between university buildings. Nevertheless, Barbour ensured that at least part of the record-sized mammoth was on display. In 1925, he mounted the forelimbs and part of the torso, forming an archway at the museum’s entrance. 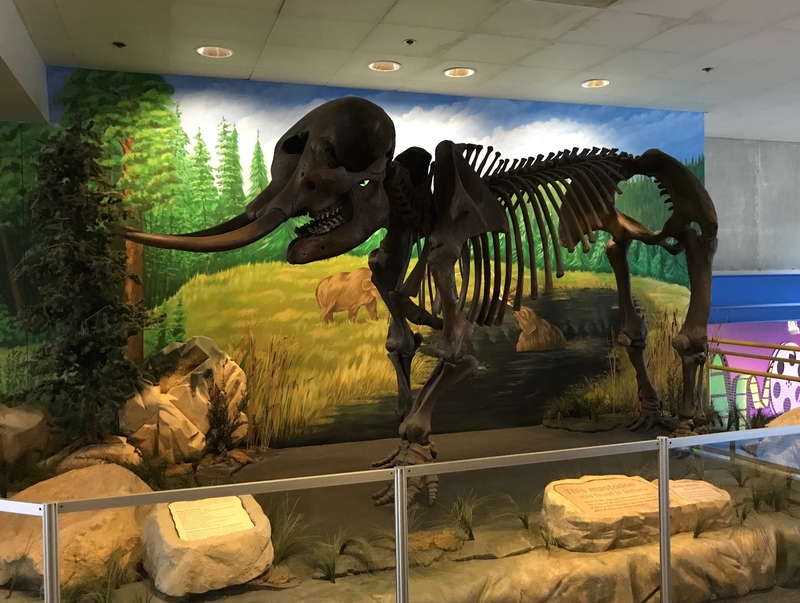 A new, larger museum building funded by donor Charles Morrill was completed two years later, and the Kariger mammoth was immediately a candidate for display as a complete mounted skeleton. Barbour sent preparator Henry Reider out that summer to collect isolated mammoth bones that could fill in Archie’s incomplete legs. Soon work on the full mount was underway, with contributions from Reider, Eugene Vanderpool, Frank Bell, and others. The 14-foot tall, 25-foot long mount took years to construct, but was finally completed in the spring of 1933. Even before Archie was complete, it was clear that the new museum’s central hall would be a showcase for fossil elephants. 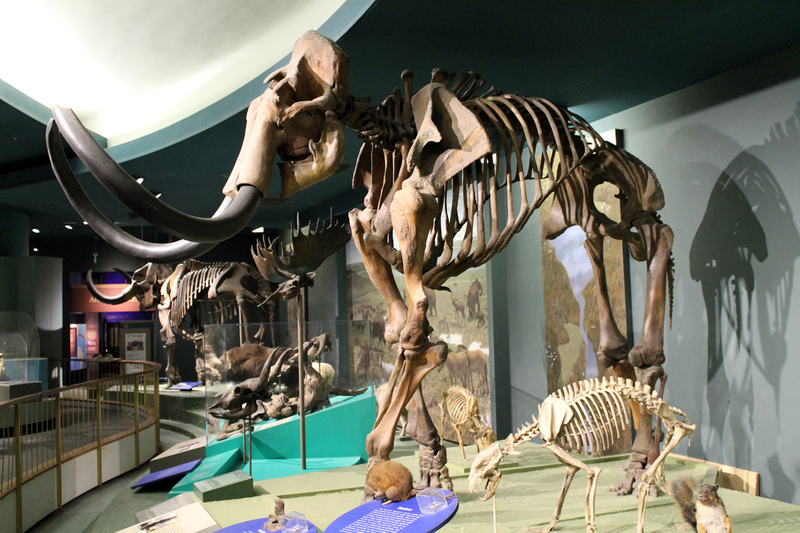 The lineup of mounted skeletons, which has not changed significantly since the mid-20th century, includes two columbian mammoths, an American mastodon, Stegomastodon, Gomphotherium, Amebelodon, Eubelodon, a pygmy mammoth, and contemporary African and Asian elephants. Elizabeth Dolan provided two parallel background murals which depict elephants around a forested watering hole in an impressionistic style. Today, a contemporary mammoth mural by Mark Marcuson adorns the far wall. 84 years after it was first assembled, the skeleton of Archie the mammoth is a Nebraska icon. Indeed, this mount and the hall it resides in have become a time capsule, a landmark to return to again and again for generations of visitors. Nevertheless, even the most beloved icons are not completely safe. The Nebraska state legislature has repeatedly hit the State Museum with budget cuts, including an astonishing 50% cut in 2003 accompanied by the dismissal of several tenured curators. Thanks to inspired leadership by Director Priscilla Grew, the museum re-earned its accreditation in 2009 and became a Smithsonian Affiliate in 2014. Still, the series of events is a sobering reminder that while museums exist as a public service, they are also dependent on public support. Funding museums must be a top priority if we want legendary displays like Archie to be on exhibit for generations to come. Many thanks to George Corner for answering my questions about Kariger’s mammoth. Any factual errors are my own. Barbour, E.H. 1925. Skeletal Parts of the Columbian Mammoth Elephas maibeni. Bulletin of the Nebraska State Museum. 10: 95-118. Corner, R.G. 2017. Personal communication. Debus, A.A. and Debus, D.E. 2002. Dinosaur Memories: Dino-trekking for Beats of Thunder, Fantastic Saurians, “Paleo-people,” “Dinosaurabilia,” and other “Prehistoria.” Lincoln, NE: Authors Choice Press. Knopp, L. 2002. Mammoth Bones. Interdisciplinary Studies in Literature and Environment. 9:1: 2002. Linnemeyer, W. and Nutt, M. 2009. Mammoth Bones and Bootleg Whiskey. 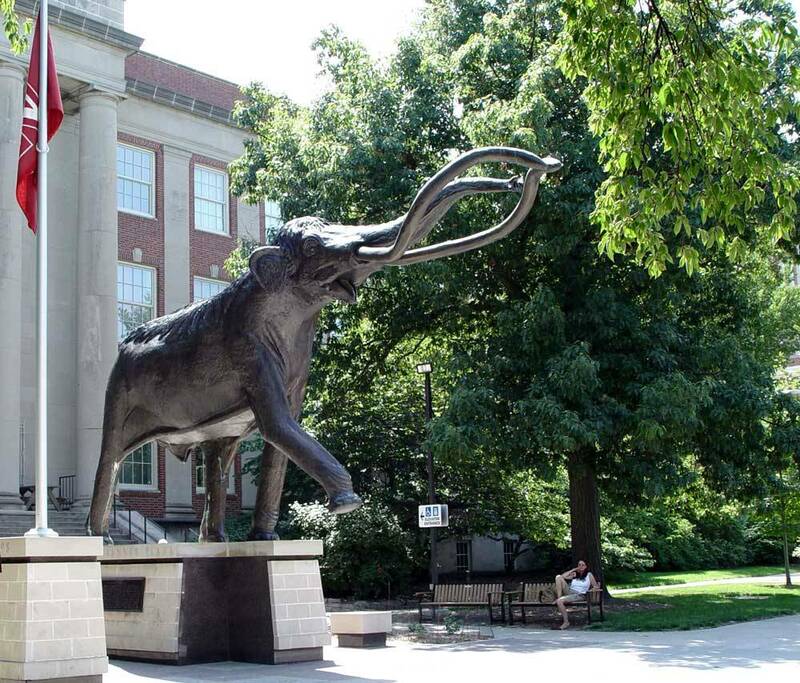 The Mammoth: A Newsletter for the Friends of the University of Nebraska State Museum. August 2009. Osborn, H.F. and Percy, M.R. 1936. Proboscidia: A monograph of the discovery, evolution, migration, and extinction of the mastodonts and elephants of the world. New York, NY: American Museum Press. The renovated hall 2 upon its initial completion. Photo from Kopper 1982. It is with some trepidation that I attempt to tell the story of the third incarnation of the National Museum of Natural History’s paleontology exhibits. For one thing, this was “my” space, insofar that any of us feel ownership over familiar public spaces. I explored these halls regularly as a toddler. I volunteered there as a teenager and interned there after college. More recently, I’ve found myself working among these same displays on a number of occasions as a museum professional*. As such, it is difficult to establish an appropriate amount of cognitive distance, even now that the galleries have been cleared from wall to wall, and new exhibits are being installed in their place. “Fossils: History of Life” closed for renovation in April 2014. Because this exhibit existed largely unchanged for most of my life, a part of me likes to think of it as something that has always been there. Nevertheless, these displays were designed and built by specific people at a specific point in time. And while the specimens, artwork, and craftsmanship in Fossils: History of Life were nothing short of iconic, the process of putting those pieces together was surprisingly contentious. The creation of this exhibit was beset by internal strife and controversy, as conflicts that had been simmering for decades about the very nature of museums finally came to bear. The east wing of the National Museum of Natural History (prior to 1964, the United States National Museum) has been home to fossil displays since the current building opened in 1910. 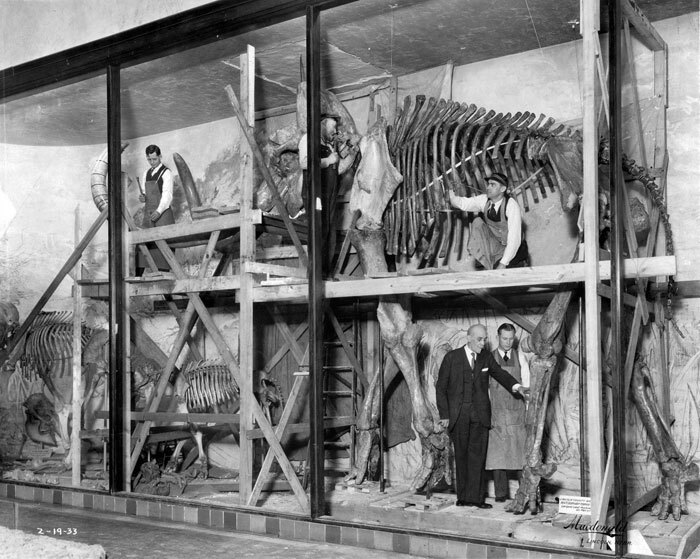 From opening day to 1945, the exhibits were primarily under the stewardship of Curator of Vertebrate Paleontology Charles Gilmore. Intermittently called the “Hall of Extinct Monsters,” this iteration was somewhat haphazard in its layout. Like many early 20th century exhibits, the galleries were filled with a sampling of static objects from the collections, occasionally accompanied by an explanatory painting, map, or model. Gilmore’s version of the east wing remained in place until 1962, when the space was redesigned as part of a Smithsonian-wide modernization project. Between 1953 and 1963, the modernization committee chaired by Frank Taylor oversaw improvements of nearly all of the National Museum’s exhibits. Taylor pushed for exhibits that catered to laypeople, rather than specialists. Paths visitors might travel through the space, common visitor questions, and consistent aesthetics were all considered when overhauling the east wing fossil halls. Modernization-era version of hall 2, completed in 1962. Photo courtesy of the Smithsonian Institution Archives. As Rader and Cain convincingly argue, the transition from exhibits dominated by cases of specimens with minimal interpretation to story-driven learning experiences began in most American museums at the beginning of the 20th century. However, this was not the case at the Smithsonian. By the 1950s, the National Museum had developed a reputation as an old-fashioned place. Its neo-classical exhibition halls mostly contained rows of cases jam-packed with specimens, and that was the way the curatorial staff liked it. Entomologist Waldo Schmitt summed up the prevailing institutional attitude when he said that exhibits should be nothing more than “show windows for displaying our wares and accomplishments.” Curators like Schmitt worried that shoehorning objects into generalized narratives about nature and anthropology would distort or occlude their meaning and provenance. NMNH Director Remington Kellogg agreed, and Taylor’s modernization committee faced an uphill battle with every exhibit they sought to make more broadly accessible. It was a stalemate between two competing visions for what a museum should be. The 1962 fossil hall renovation at NMNH experimented with dioramas, color-coded signage, and text divided into area titles, headings, and subheadings, but compared to peer institutions it was hardly revolutionary. This could be partially attributed to the design process, in which the development of each of the four east wing galleries (halls 2, 3, 4, and 5) was led by a different curator. As a result, the galleries landed in different places on the spectrum between traditionally-arranged specimens and cohesive narratives. The 1974 Ice Age Hall was a turning point for NMNH exhibits. Photo by the author. Nevertheless, a turning point was on the horizon. The east wing modernization plan also called for the annexing of hall 6 (formerly the home of geology exhibits) as a dedicated Hall of Quaternary Vertebrates. In part due to the larger number of new specimens being prepared for display, this Quaternary Hall was repeatedly delayed. By the time hall 6 was ready to reopen in 1970, its old-fashioned organization was no longer what administrators wanted. In 1973, Director Porter Kier decided to shut down the nascent Quaternary Hall and assemble a new team to redesign it. 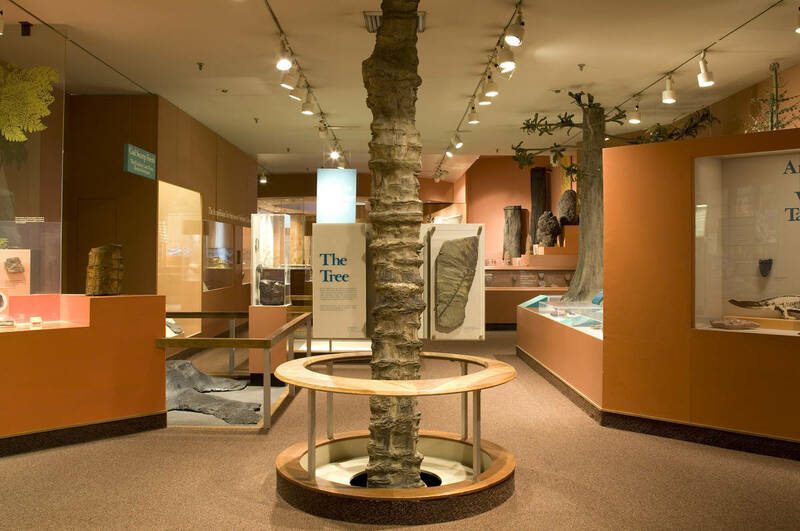 A group of geologists, anthropologists, paleontologists, and education specialists reworked the exhibit into an interdisciplinary exploration of the ice ages. Continental glaciation, the evolution and extinction of large mammals, and the rise of humans were all presented as a single, holistic story. For NMNH staff, it was clear that the 1974 Hall of Ice Age Mammals and the Rise of Man represented the future of exhibition at the museum. From that point onward, exhibit design would be a collaborative process between curators, educators, and exhibit specialists. Moreover, the galleries themselves would be seen more like fully-formed architectural spaces, rather than modular associations of artifacts. Above all, the primary purpose of exhibits would be the education and engagement of visitors. The phrase “all-encompassing hall” is key. The curators agreed that, unlike the 1962 iteration, the new exhibit should have a single voice and follow a single narrative. This decision was influenced not only by changing expectations for exhibits, but also by recent developments in their own department. The NMNH Division of Paleontology had been disbanded in 1963, and paleontologists were reorganized into the Department of Paleobiology. The new title represented a push among research staff to focus less on descriptive systematics and more on how the fossil record can inform our understanding of evolution and ecology. Macintyre’s team wanted to bring the same change of focus to the new exhibit. 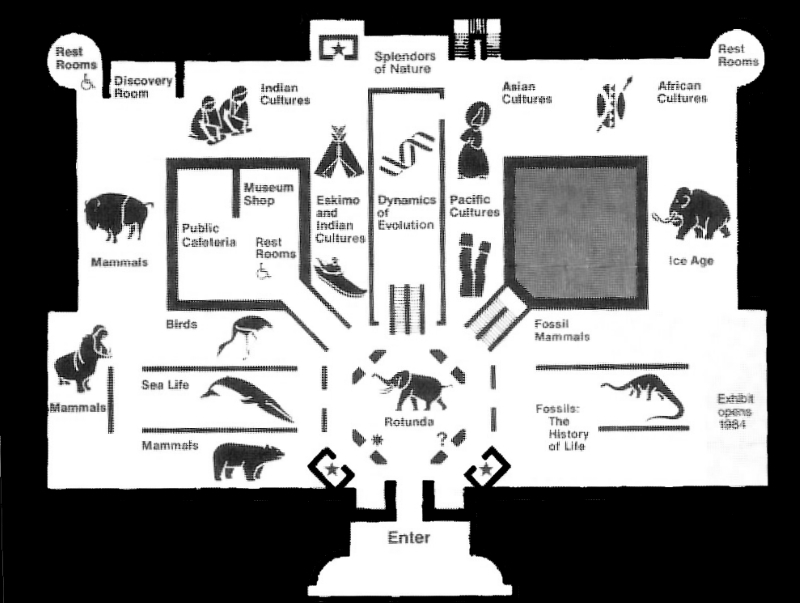 Visitor map of NMNH ground floor, circa 1982. Adapted from Yochelson 1985. The curators spent the next year hashing out the hall in further detail. 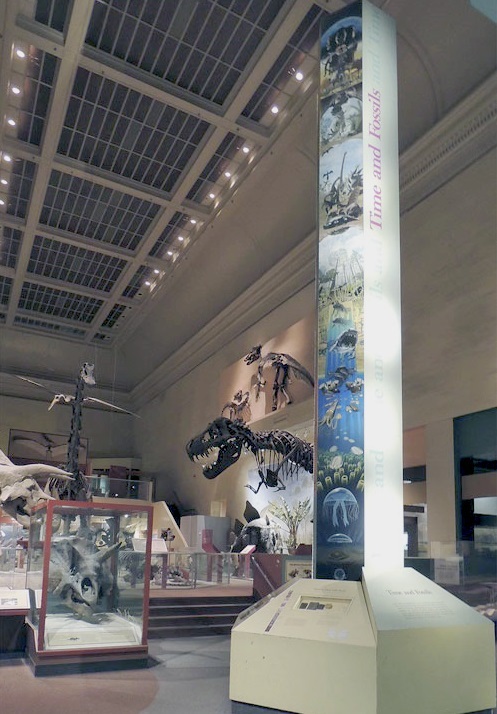 Early on, the group agreed that an illustrated column of geologic time should be the exhibit’s centerpiece. This would eventually manifest as the “Tower of Time,” with key artwork provided by John Gurche. The group also decided to break the main “progress of life” concept into several smaller storylines, which they counterintuitively called “highlights.” The highlights would include “The Earliest Traces of Life,” “Conquest of the Land,” “Reptiles: Masters of the Land,” “Living Fossils,” “Fossils and Industry,” and “Mammals in the Limelight,” among others. Each highlight would correspond to a part of the east wing exhibit space. The central, high-ceilinged hall 2 would be occupied by Reptiles: Masters of the Land, which included the dinosaurs, as well as a substantial display of of Paleozoic marine invertebrates at the rotunda-side entrance. A new mezzanine and ramp over hall 2 would include Living Fossils, Fossils and Industry, the evolution of flight, and fossil fishes. Hall 4 would feature Earliest Traces of Life and Conquest of the Land. Mammals in the Limelight would occupy hall 3, and hall 5 would remain empty for the time being. For practical reasons, the highlights would each be overseen by a different subcommittee of specialists, and they would be built and unveiled on a staggered schedule. Still, the main committee would oversee the entire process and make sure the writing and visual design of each section came across as parts of a cohesive whole. Between the lines, the need to include dinosaurs was apparently seen as a nuisance by at least some of the curators. There were no dinosaur specialists on the exhibit team, and indeed, NMNH had not employed one since Gilmore retired in 1945. Although the dinosaur renaissance was picking up speed by the late 70s, for NMNH paleontologists dinosaurs were overexposed and less interesting than their own research subjects. The museum’s eleven dinosaur mounts were decades-old relics, but their popularity among visitors obligated the curators to include them. Disarticulating and remounting the skeletons was not in the budget, and many of the dinosaurs were too big to cart out of the hall in one piece. That left the exhibit team with the unenviable task of finding places for the existing mounts in addition to all the new specimens and models they wanted to add, while still leaving enough room for visitors to get around. As internal legend has it, the giant slab of Climactichnites tracks was placed at the front of hall 2 specifically to block the view of the dinosaurs from the rotunda. You’ll look at invertebrate fossils first, and you’ll like it! Photo by Loren Ybarrondo. 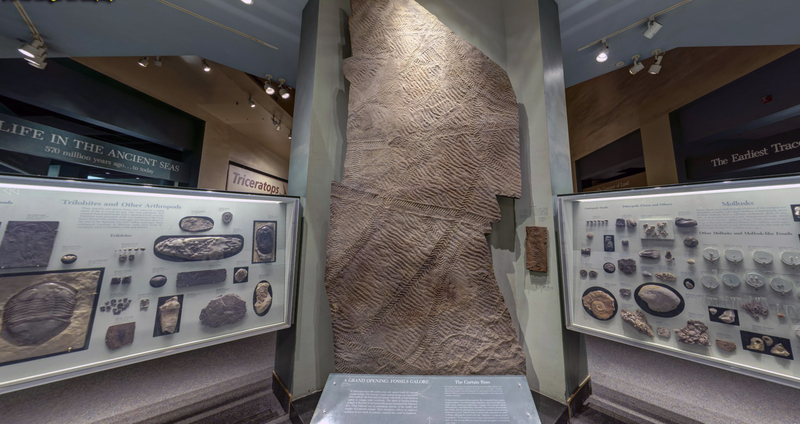 Screen capture from NMNH Virtual Tour. Although Macintyre and his curator colleagues were the only formal members of the exhibit committee, the Department of Exhibits was also involved from the start. 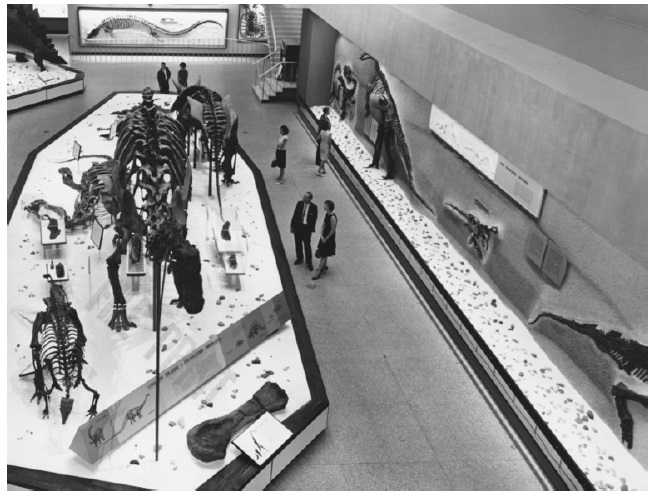 Exhibits staff at NMNH had increased from six people in the 1960s to over 30 by 1985. This expanded force included all manner of artists, architects, industrial designers, and communications specialists, and they had an impressive on-site workshop to make use of their talents. In the 1980s, everything from silk-screened signage to cabinetry to dioramas could be created in-house. However, the increased professionalization of exhibits specialists required curators to relinquish some of the control they historically had over displays. This, unfortunately, led to the two departments regularly butting heads. Curators complained that exhibits staff did not know enough of the science, and that the ideas they were generating simplified content to the point of being inaccurate. Meanwhile, exhibits staff had to deal with the fact that the curators had final approval authority over all content, but typically saw the exhibit work as secondary to their research obligations. Deadlines were routinely missed, leading to frenzied, last-minute crunch periods. The result was signage with avoidable errors making it the exhibit floor, and a culture of finger pointing in all directions. This clay and paper model of the reconfigured hall 2 was produced during the planning period. Courtesy of the Smithsonian Institution Archives (but the terrible photo is my fault). John Elliot’s Diana of the Tides fresco was briefly visible during the renovation of hall 2. Photo courtesy of the Smithsonian Institution Archives. Two postdoctoral research associates – Jessica Harrison and George Stanley – were brought on board to help with the exhibit design and construction. Harrison and Stanley had offices in both the Exhibits and Paleobiology departments, and were well-liked by both groups of staff. The most difficult part of their job was drafting label copy. Text had to be rewritten again and again to please educators who found it too technical and content specialists who demanded more precision and detail. Harrison in particular was widely praised for effectively explaining scientific concepts to the exhibits staff and for guiding the key themes of the exhibit from concept to completion. 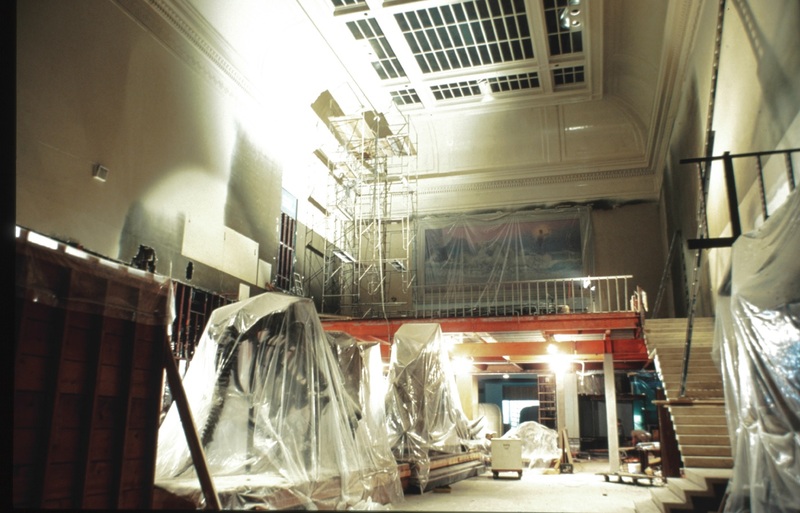 The east wing exhibits formally closed for renovation on May 29, 1979. In spite of the administrative-level disagreements, the museum’s technical staff was producing great creative work in short order. The recent expansion of the Department of Exhibits meant that nearly everything that went into the exhibit was created in-house (today, large exhibits are created largely in collaboration with contractors). Only the biggest construction projects, such as the addition of a mezzanine over hall 2, had to be contracted out. Arnie Lewis puts the finishing touches on Eryops. Photo from Smith 1994. Scores of never-before-exhibited specimens were prepared for Fossils: History of Life. 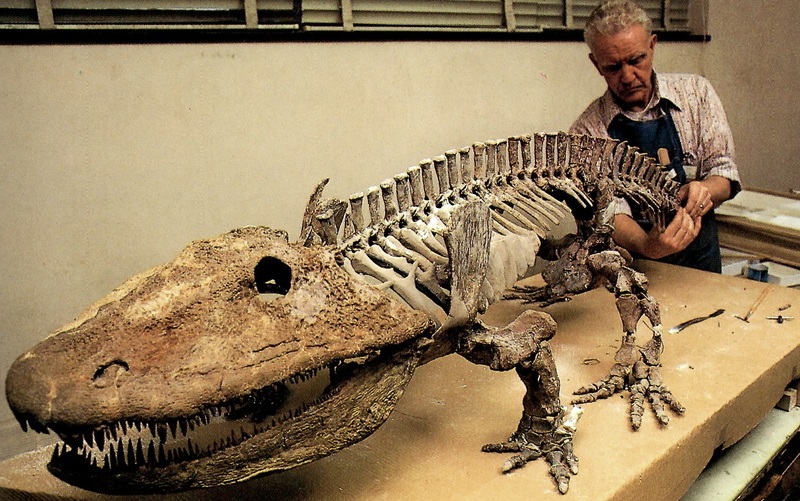 Examples include a 4.6 billion-year-old meteorite from Australia, the reconstructed jaws of Carcharocles megalodon, and curator Nicholas Hotton’s beloved Thrinaxodon fossil, which he called “baby doll.” Preparator Arnold Lewis led the creation of the new mounted skeletons, which included Eryops and Strobodon. 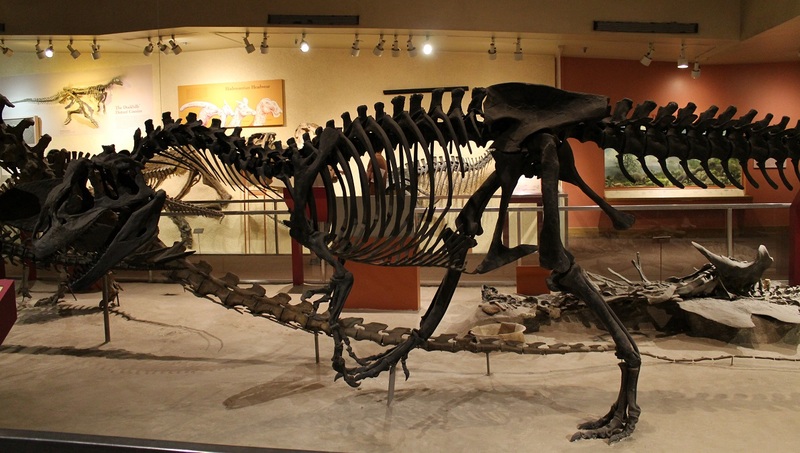 Some existing mounts were updated, including Dimetrodon, which was given a longer tail. The most ambitious new mount was Allosaurus, or as Hotton insisted on calling it, “Antrodemus.” The Allosaurus (USNM 4734) came to NMNH in the 1890s with the rest of the Marsh collection, but only the skull and a few other pieces had ever been displayed. Lewis spent two years creating the mount. He started by preparing the bones that had never been completely freed from the matrix they were found in. After laying the skeleton out in a giant sandbox, Lewis secured the bones one at a time to a custom steel armature. This form-fitting structure proved to be almost invisible against the dark grey bones. Unlike most theropod mounts of the time, Lewis’s Allosaurus included belly ribs, modeled in rubber after those of a crocodile. Antro – er, Allosaurus. Photo by the author. Fossils: History of Life also called for a number of new paintings and dioramas. Peter Sawyer painted a cyclorama of a primordial Archean landscape for the Earliest Traces of Life section. Robert Hynes contributed several murals, as well, including a beach scene and a Cooksonia marsh for Conquest of the Land. In addition to the key art on the Tower of Time, John Gurche provided illustrations for the horse evolution cul-de-sac and the backdrop for a new lungfish diorama. Jay Matternes’ Cenozoic murals were carried over from the old exhibit. Sawyer’s recreation of Archean Greenland. Photo by Loren Ybarrondo. Screen capture from NMNH Virtual Tour. 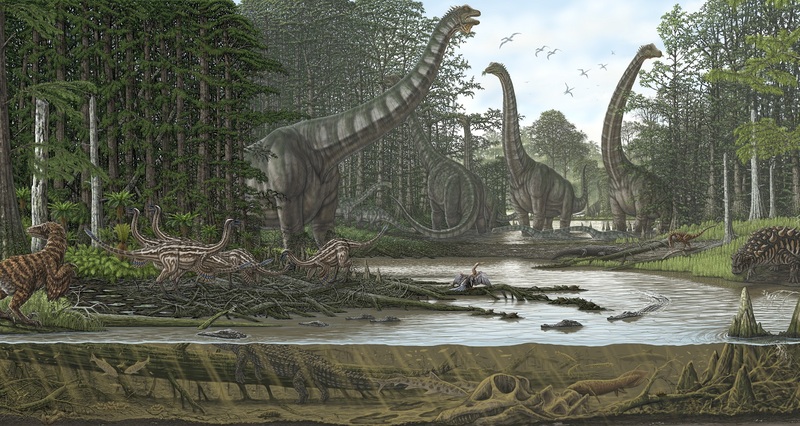 Diorama depicting the earliest land vertebrates, with a background by John Gurche. Photo by the author. 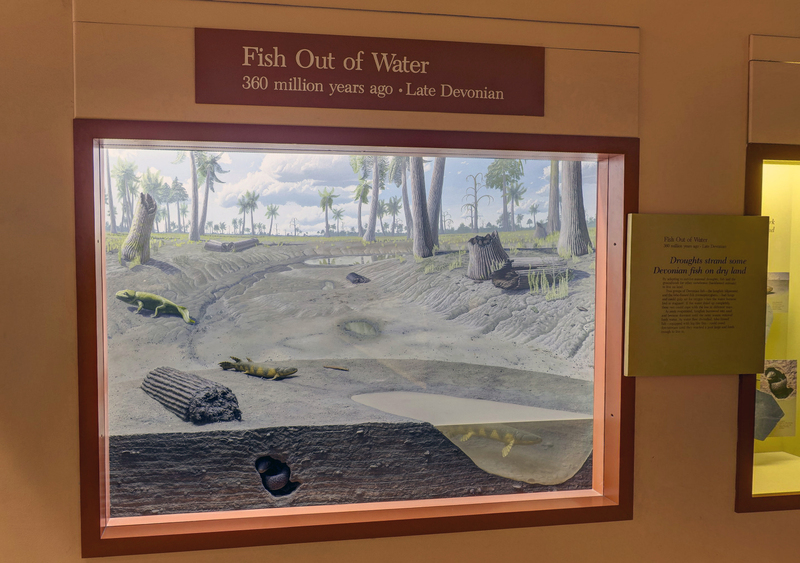 George Merchand’s marine dioramas and Norman Deaton’s dinosaur dioramas were reused, while the NMNH exhibits shop produced several brand new displays. In addition to the aforementioned lungfish scene, these included a recreation of the Burgess Shale environment and a group of eurypterids patrolling the Silurian shallows. There was also a walk-through diorama of a Cretaceous Maryland forest, featuring reconstructions of some of the earliest flowering plants. The Smithsonian’s central exhibit shop handled the most challenging projects. Their biggest contribution was the life-sized Quetzalcoatlus model. The artists started with a clay miniature, then moved on to a 1/6th scale fiberglass model. With final approval from Nicholas Hotton and Jessica Harrison, the team moved on to the 40-foot final version. The wings were constructed like those of airplanes, with a hollow steel rod supporting wood and aluminum trusses. The wing membranes were plastic, and translucent in the right light. The head and legs were sculpted in clay then cast in plastic, and the body was covered in deer fur. Exhibits Central also built a set of cycads to accompany the historic Stegosaurus model. Several of these were real conifers, freeze dried and covered in glycerin. How to built a Quetzalcoatlus in the late 70s. Photos from Kopper 1982. Finally, Fossils: History of Life included some of NMNH’s first forays into video displays. The “Enter Life” film explored possible scenarios for biogenesis. An animated film starring “Frank Anchorfish” and “Arthur Pod” (voiced by DC-area newscasters) was a whimsical take on the challenges of moving from the aquatic to the terrestrial realm. A popular, albeit short lived, part of the exhibit was “A Star is Hatched,” which featured clips from Hollywood dinosaur movies accompanied by discussion of dinosaurs’ pop culture significance. On April 17, 1980, Hall 4 – with exhibits covering the origins of life, the transition to life on land, and Paleozoic and Mesozoic plants – was the first part of the east wing to reopen. 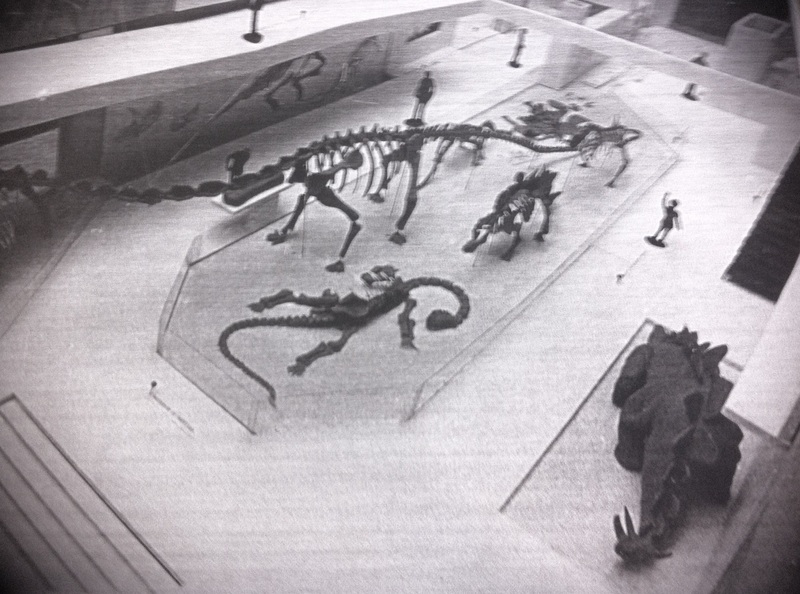 The dinosaur-filled hall 2 followed on December 4, 1981. These initial phases of Fossils: History of Life were generally well-received by the public, although some media critics scoffed at the silly puns and cultural references in the label copy (“A duckbill in every pot,” “the better to eat you with, my dear,” and so forth). Robert Emry took over for Ian Macinyre as lead curator for the final phase of development and construction. After a few delays, Mammals in the Limelight in hall 3 was ready for visitors on May 30, 1985. Behind the scenes, the occasionally tense working relationships and difficulty meeting deadlines contributed to major changes to how exhibits are put together at NMNH. When Richard Fiske took over as Director in 1983, he promoted Beth Miles, Sheila Mutchler, and Sue Voss from the Department of Exhibits to formal members of the paleontology exhibit team. A dedicated project manager position was added, and formal guidelines were prepared for exhibit-related duties. A key part of this formalized exhibit protocol was explicit acknowledgement that exhibits (not research and collections) are the public face of the museum and therefore the primary impetus for public support. Maintaining that support meant creating visitor-focused exhibits that are as relatable, educational, and entertaining as possible. This effectively killed the old idea of exhibits as mere showrooms for collections. Research and collections staff were no less important to the identity and purpose of the museum, but as far as exhibits were concerned their content knowledge would have to go hand in hand with other kinds of expertise. Exhibits and education specialists took leadership roles on future exhibit projects, a system which remains in place to this day. A Callixylon trunk was a focal point in hall 4. Photo by Chip Clark. Fossils: History of Life saw many changes over its 33 year life span. A Star is Hatched was one of the first displays to go. While popular among visitors, scientific staff hated the film because it trivialized exhibit content and featured long-outdated images of dinosaurs (interacting with modern humans, no less). The theater built for A Star is Hatched was eventually demolished and replaced with a windowed fossil prep lab, which became one of the most popular parts of the exhibit complex. An enclosure housing a live caiman in the Living Fossils area of the mezzanine only lasted as long as the animal. When the caiman died, the exhibit was boarded up and never replaced. Later, the Flowering Plant Revolution area – including the walk-through diorama – was dismantled to make way for a concessions stand. The largest addition to the east wing was Life in the Ancient Seas, an exhibit of marine fossils that filled the unused portion of hall 5. 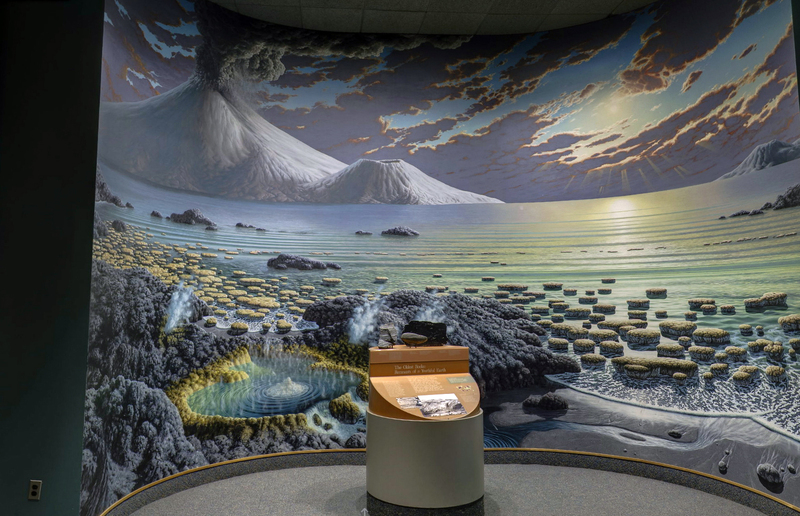 Completed in 1990, Life in the Ancient Seas nearly doubled the number of specimens in the fossil halls and added a splash of color with Ely Kish’s 150-foot mural of extinct marine life. Hall 2 in 2013, with Stan the T. rex and the revised Hatcher the Triceratops in place. Photo by the author. More recently, three of the historic dinosaur mounts were taken off exhibit and replaced with updated casts. Triceratops, Camptosaurus, and Stegosaurus had been on display since 1905, 1912, and 1913, respectively, and a century of vibration from passing crowds and fluctuating temperature and humidity had taken their toll on the fragile fossils. Ralph Chapman took the opportunity to turn the Triceratops into the world’s first digitized dinosaur, pioneering a process that is standard practice today. The Triceratops that returned to the hall in 1999 was made from foam and plastic molded directly from digital scans of the original fossils. It was accompanied by a mini-exhibit that explained how the new mount was made, and featured artwork by Bob Walters in addition to several new original and cast skulls. Shortly thereafter, NMNH acquired a cast of Stan the Tyrannosaurus as a conciliation prize for missing out on Sue. Camptosaurus and Stegosaurus were removed and replaced more quietly, but these mounts are of note because much of the casting and restoration work was done by a crew of veteran volunteers. The mezzanine over hall 2 was closed for safety reasons after a 2011 earthquake. These exhibits never reopened, which meant that visitors could no longer see the pterosaurs, phytosaurs, and Xiphactinus. 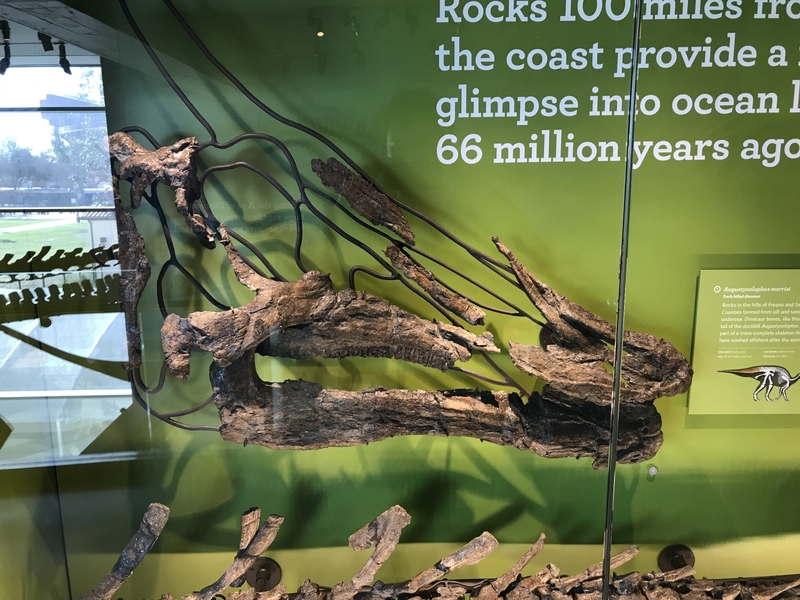 In the exhibit’s final years, an assortment of new signs were added, including updates to geologic time scale and an explanation of the dinosaur-bird connection. Unfortunately, these updates amounted to little more than bandaids for an increasingly tired exhibit. Hall 3’s Mammals in the Limelight was delayed for over a year but finally opened in 1985. Photo by the author. In retrospect, Fossils: History of Life was conceived at an inopportune time. Some aspects, like the focus on biology and evolution rather than classical systematics, were cutting-edge. 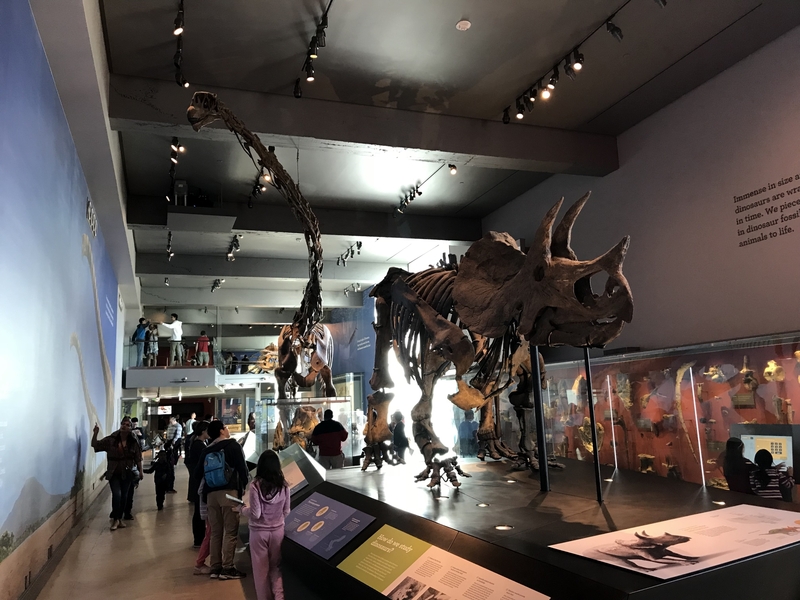 However, much of the exhibit content was quickly outmoded by sweeping changes to the field of paleontology that occurred during the 80s and 90s. Conservative ideas about dinosaur endothermy and bird evolution were obsolete within a decade, as was much of the pre-cladistics taxonomy and the central theme of evolution as progress. 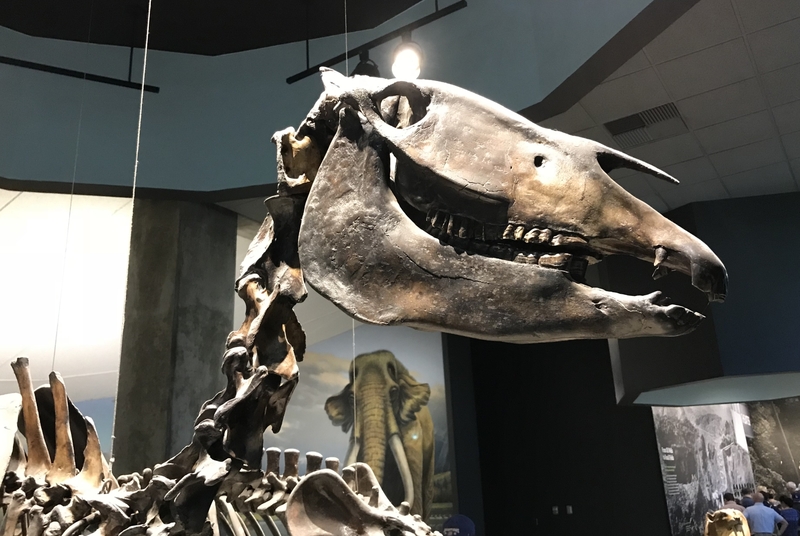 The exhibit team could not have known how different our understanding of paleontology would be just a few years after the renovated halls debuted. 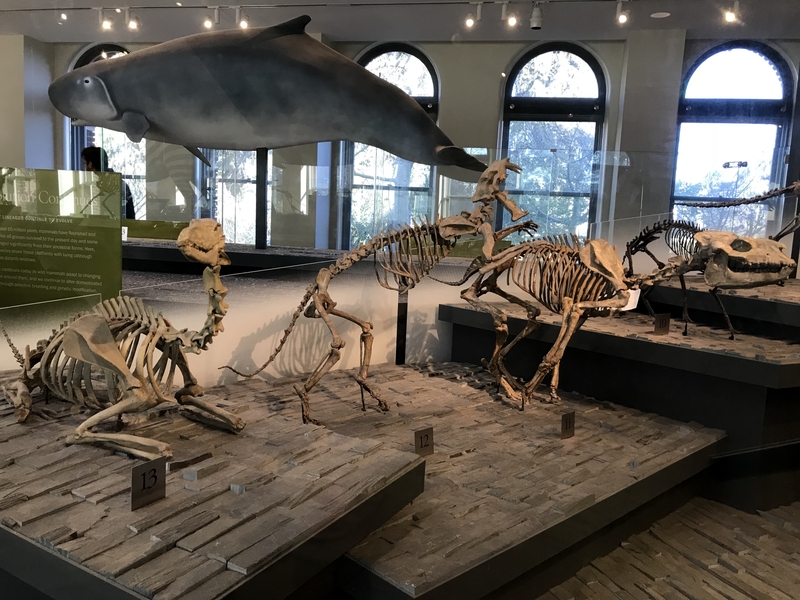 Moreover, the fact that Fossils: History of Life was built over the skeleton of the 1963 renovation (which was, in turn, built on top of the original east wing exhibits) proved to be a significant handicap. 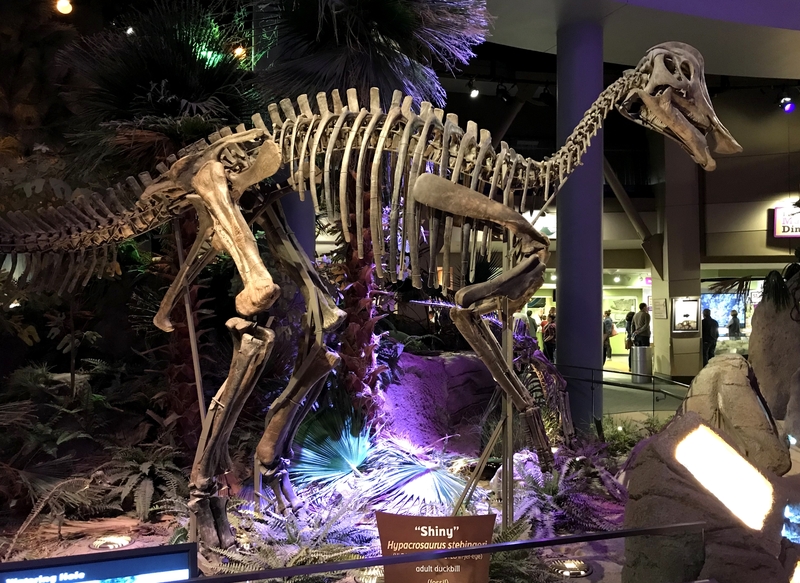 Since the space was never completely gutted, the designers had to work around existing specimens and structures, such as the 80-foot Diplodocus and the three separate doorways off of the rotunda. As a result, creating a logical path for visitors to follow through the halls proved impossible. Updates and additions to the exhibit only exacerbated the issue. As it stood in its final years, there was no way to view Fossils: History of Life in historical order without repeatedly doubling back. Bottlenecks that impeded traffic flow were also a problem, especially during mid-afternoon rush hour at the T. rex. *Please note that this is my personal blog and I am solely responsible for its content. For official information from NMNH and the Smithsonian Institution please see Digging the Fossil Record and the Department of Paleobiology. Bohaska, S. 2013. Personal communication. Kopper, P. 1982. The National Museum of Natural History: A Smithsonian Museum. New York, NY: Harry N. Abrams, Inc.
Park, E. 1981. A Remarkable Tower of Time Tells the Story of Evolution. Smithsonian Magazine. December 1981, pp. 99 –114. Parrish, M. 2017. Personal communication. Post, R.C. 2013. Who Owns America’s Past? The Smithsonian and the Problem of History. Baltimore, MD: Johns Hopkins University Press. Rader, K.A. and Cain, V.E.M. 2014. Life on Display: Revolutionizing US Museums of Science & Natural History in the Twentieth Century. Chicago, IL: University of Chicago Press. Smith, N. 1994. Official Guide to the National Museum of Natural History/National Museum of Man. Washington, DC: Smithsonian Institution Press. 1986. Statement by the Secretary. Smithsonian Year 1985: Annual Report of the Smithsonian Institution for the Year Ended September 30, 1985. Washington, DC, Smithsonian Institution. Thomson, P. 1985. Auks, Rocks, and the Odd Dinosaur: Inside Stories from the Smithsonian’s Museum of Natural History. New York, NY: Thomas Y. Crowell. Wolf, R.L. and Tymitz, B.L. 1978. Whatever Happened to the Giant Wombat: An Investigation of the Impact of the Ice Age Mammals and the Emergence of Man Exhibit. Washington, DC: Smithsonian Institution. Yochelson, E.L. 1985. The National Museum of Natural History: 75 Years in the Natural History Building. Washington, DC: Smithsonian Institution Press. Start with A 21st Century Hall of Mammals – Part 1. The Kenneth E. Behring Family Hall of Mammals opened at the National Museum of Natural History in November 2003. The hall’s airy, minimalist aesthetic represented a radical departure from traditional wildlife exhibits, shaking off taxidermy’s dusty reputation and utilizing the museum’s mammal collection to tell the story of evolution for modern audiences. As we saw last time, developing such an exhibit was not without controversy – everything from the source of funding to the ethics of demolishing historic dioramas came under intense scrutiny. In this post, we’ll explore the work that went into building the exhibit, and how the team’s bold vision eventually paid off. The Hall of Mammals cost $31 million and involved over 300 people. However, the job of constructing or updating the 274 taxidermy mounts was largely done by three individuals. John Matthews and Paul Rhymer were the Smithsonian’s last full-time taxidermy specialists. Rhymer in particular was a 3rd generation legacy – his grandfather had worked on the now-dismantled dioramas in the old mammal halls. The newcomer was Ken Walker, an award-winning taxidermist who moved to Washington from Alberta to work on the exhibit. Beasts take shape in a massive workshop just outside the beltway. Matthews, Rhymer, and Walker set up shop in a 50,000 square foot studio in northern Virginia. As museum taxidermists, they took no shortcuts in making the animals they built look right. The process for a creating a given mount would start with hours of research, using photos and videos to get a sense of the animal being recreated. The goal is to get inside the creature’s head, to understand how it thinks, moves, and behaves. Next, the artist builds a clay sculpture, either from scratch or using a commercial mannequin as a starting point. It is at this stage that the pose and attitude are set, and the bulge of every bone and muscle must be perfect. Only then can the tanned skins be stitched onto the sculpture and final adjustments be made. A single animal can take 100 hours or more to create. Making the animals for the Hall of Mammals was particularly challenging because the designers called for so many dramatic and unusual behaviors. These animals aren’t just standing around – the gerenuk is stretching to full height in order to browse from a tree, the bobcat is leaping to catch a bird in mid flight, and the giraffe is spreading its forelimbs and bending down to drink. Cutaways reveal an anteater’s tongue snaking into an insect nest and a blackfooted ferret interloping in a prairie dog burrow. Achieving this level of dynamism with clay, wax, and dead fur is only possible with a top-notch understanding of biomechanics. 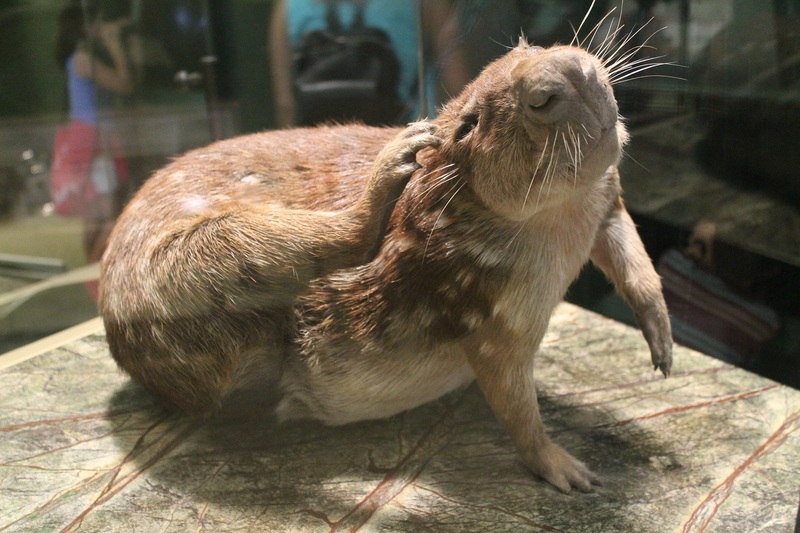 This paca scratching itself behind the ear is an example of the expressive and dynamic mounts produced for the Hall of Mammals. Photo by the author. 90% of the featured animals are on display for the first time, and the pelts came from a variety of sources. NMNH sent out a wishlist to museums, zoos, research facilities, and private collectors. A tree kangaroo came from the National Zoo’s offsite research facility in Virginia. The okapi had recently died of old age at Chicago’s Brookville Zoo. The playpus and koala were imported from Australia, and the leopard, jackal, and Chinese water deer were from Kenneth Behring’s personal collection. All of the animals came from existing collections – nothing was killed specifically for the new exhibit. Given modern sensibilities and the museum’s conservation-oriented mission, this was a laudable decision. Nevertheless, using old specimens created many new challenges. The tiger and panda that had been at NMNH for over a century had faded fur, which had to be dyed. The orangutan was a lab animal preserved in a vat of alcohol. The fur was usable, but the face and hands were ruined, and had to be reconstructed. Only a male lemur was available, but some clever alterations turned it into a female carrying a baby. The Brookfield zoo okapi had hooves which were overgrown from lack of use. The taxidermists filed them down to make the animal look like its wild counterparts. In many cases, the taxidermists were not merely making dead animals look alive, they were creating imaginary lives that these individuals never actually had. 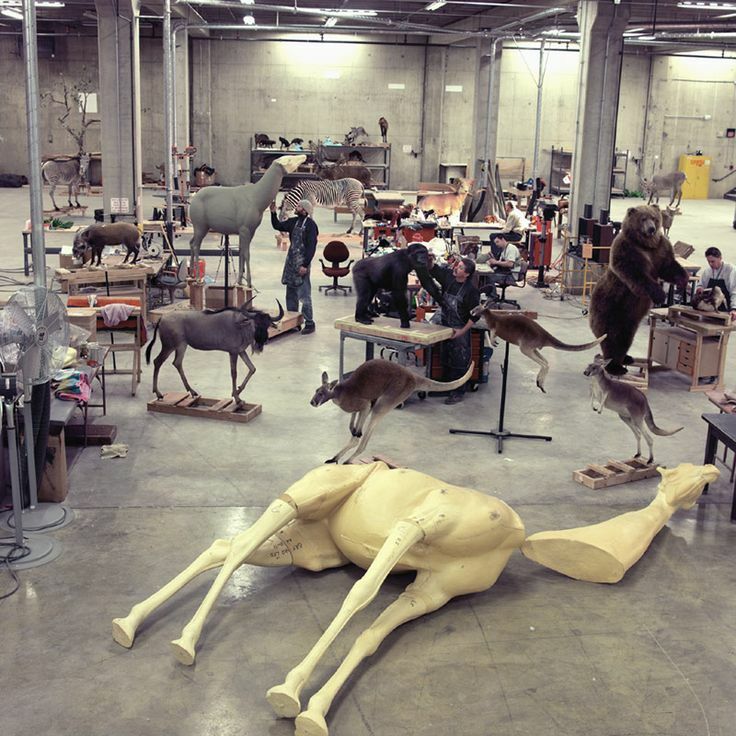 While the taxidermists were working 10 to 12 hour days building the animals, yet another team was working on creating the spaces they would inhabit. The animals would be set in minimalist, conceptual environments – a terraced floor suggests a watering hole, and metal poles and plastic tubes stand in for branches and trees. The specimens are presented like sculptures in an art gallery, or perhaps trendy gadgets at a tech showcase. Visitors explore the Apple Store of taxidermy. Photo by the author. A key aspect of the new hall is the restoration of the west wing’s original Beaux Arts architecture. Designed by the historic Washington architectural firm Hornblower and Marshall, the space was originally a three-story neoclassical chamber with a large skylight and ornate plaster and chrome embellishments. Over the years, false walls had been added to carve the hall into ever smaller spaces to accommodate new exhibits. The original architects may have been on to something, however. 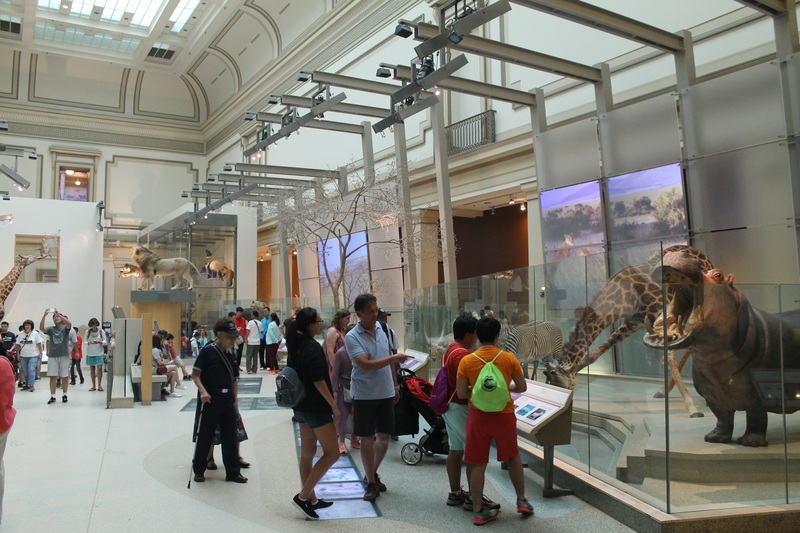 NMNH gets upwards of seven million visitors every year, and crowding is a common complaint. 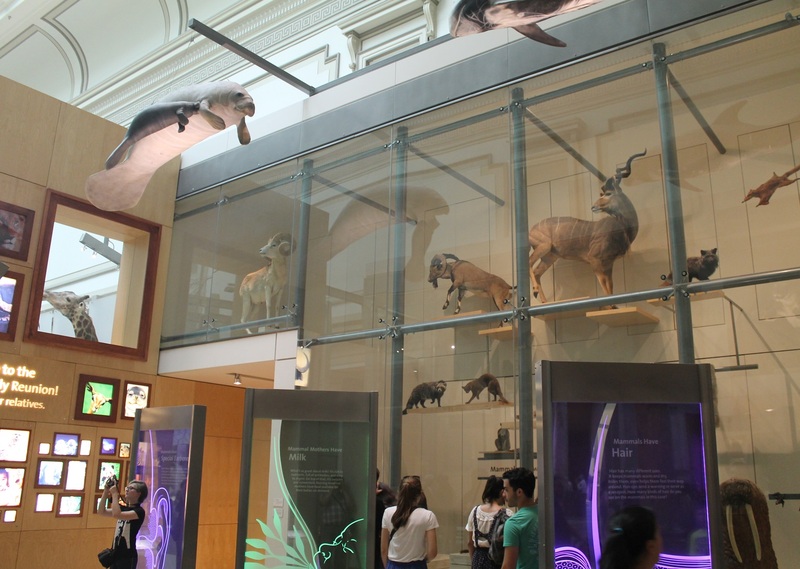 To help mitigate this, the Hall of Mammals design team wanted to return to the wide open floor plan, with lots of space for visitor traffic and multiple viewing angles on most specimens. Starting in 1999, Hayes, Seay, Mattern and Mattern spent two years restoring the west wing to its former glory. 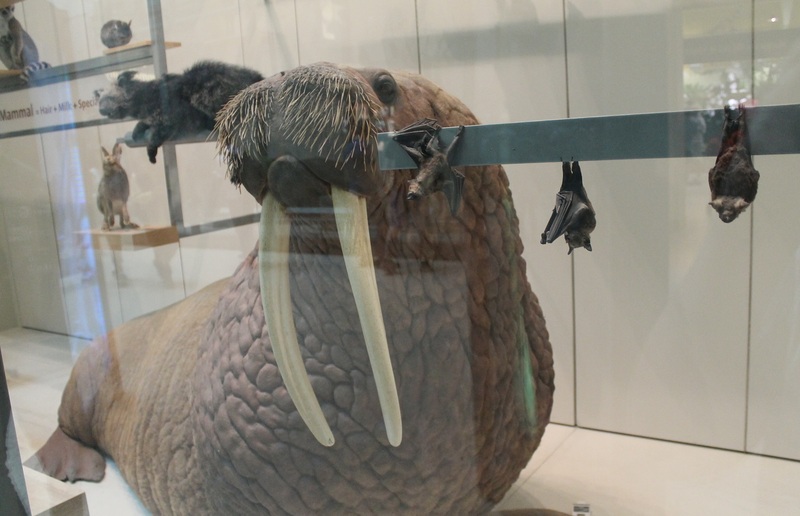 The Hall of Mammals uses contrast as a key visual motif – in this case the huge walrus juxtaposed with tiny bats. Photo by the author. Throughout the hall, the architecture is meant to compliment and support the hall’s interpretive themes. The exhibit drives home the point that mammals are tremendously diverse, but also similar in key ways due to their common ancestry. 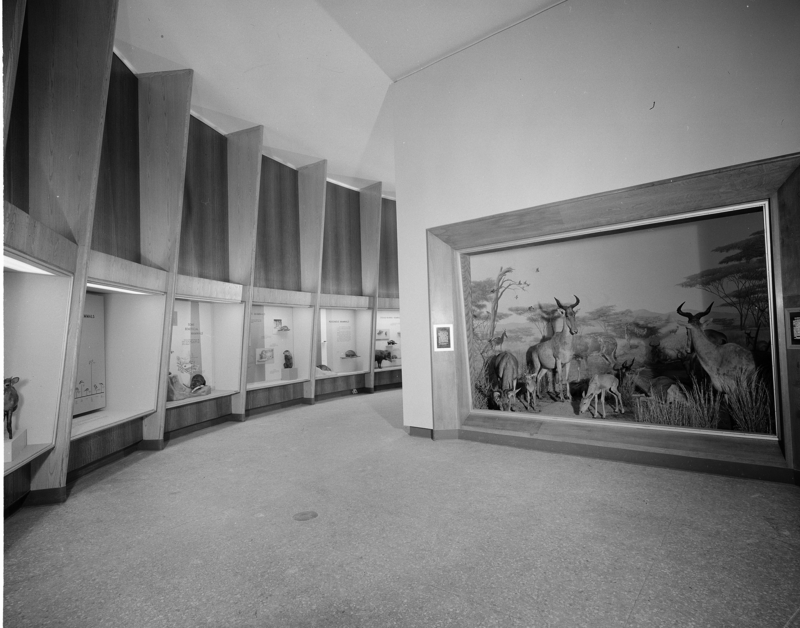 The entry space, flanked by two-story cases of taxidermy specimens, illustrates that diversity. Contrast is a key visual motif: large animals beside small ones, specimens exhibited high and low, and so on. Height in particular is used to keep visitors looking in all directions. A leopard snoozes on a branch over visitors’ heads, while a platypus in its burrow can only be seen by crouching down. Meanwhile, the perimeter of the hall is devoted to animals that share particular habitats, referencing the impact environmental change has had on mammalian evolution. Animals of the North American forest. Photo by the author. The completed Hall of Mammals occupies 25,000 square feet, minus about 3,000 annexed by a gift shop and special exhibit space. It contains 274 taxidermy specimens, 12 fossil replicas, and numerous sculptures and interactives. 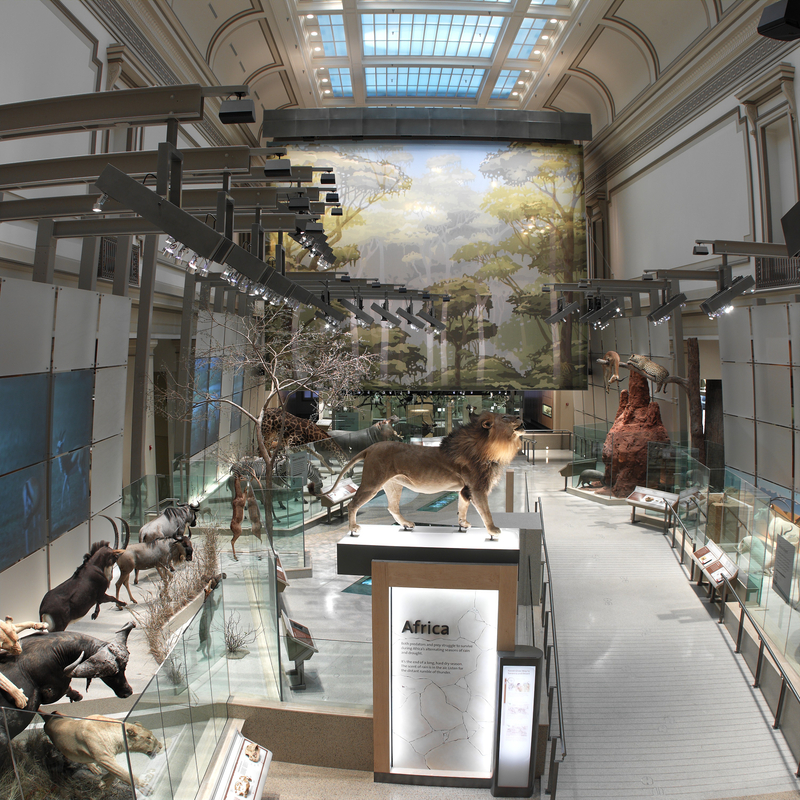 The hall is the culmination of five years of work – a long time to be sure, but a breakneck pace compared to the 25 years it took to complete the classic Akeley Hall of African Mammals at AMNH. It was also one of the biggest taxidermy projects attempted in the past 80 years, and for at least a little while, it made Matthews, Rhymer, Walker, and their peculiar trade into stars. The Hall of Mammals received at least nine industry awards, and has become a benchmark for exhibits in development today. Teachers have also praised the exhibit – writer Sharon Berry’s text is pitched for families, and written with National Science Foundation Life Science Standards in mind. While the exhibit has showy special effects and some playground-like elements, the meaning and message is omnipresent. While historic wildlife dioramas are incredible works of art and science, they are absolutely of another time. Indeed, a major part of their appeal is that they are a look into the past, to an era when naturalists believed ecosystems could be summed up in a window box. For all their meticulous detail, dioramas have never been able to truly recreate nature. They are uncanny reflections of nature, filtered through the worldview of their creators. Dioramas have great cultural and intellectual value, and it is a tragedy whenever one of these irreplaceable time capsules is lost. At the same time, though, NMNH should be commended for stepping outside the box (so to speak). The Hall of Mammals does not attempt to replicate the experience of viewing living wildlife – it showcases the diversity of nature in a way that only a museum can. It’s gorgeous, engaging, informative…and it’s a beast all its own. Liao, A. 2003. Natural history exhibits venture beyond black-box dioramas. Architectural Record 11:04:275279. Milgrom, M. 2010. Still Life: Adventures in Taxidermy. New York, NY: Mariner Books. Polliquin, R. 2012. The Breathless Zoo: Taxidermy and the Cultures of Longing. University Park, PA: The Pennsylvania University Press. The Hall of Mammals upon its 2003 opening. Photo by John Steiner, courtesy of the Smithsonian Institution Archives. In her 2010 book Still Life: Adventures in Taxidermy, Melissa Milgrom compares the making of a 21st century taxidermy exhibit in a major museum to “building an indoor skiing facility in Dubai” (Migrom 2010, 90). It’s a lot of work for something nobody asked for, but that doesn’t mean it can’t be successful. A century ago, before zoos were widespread and before wildlife videos were a click away, mounting animal pelts on mannequins was the best way to bring nature to an increasingly industrialized populace. Today, taxidermy exhibits seem inherently antiquated, even creepy. Taxidermy is by no means a dead art (competitions are still going strong), but the practice has certainly lost some of its grandeur. For most, the aversion to taxidermy begins and ends with the discomfort of being confronted with a dead animal. There is of course far more complexity to unpack, from the uneasy suspension of disbelief stemming from seeing an animal skin made to look alive to the taxidermy piece’s multifaceted identities (including natural specimen, work of art, historic relic, and so forth). Who was this creature, and how did it die? How did it end up on display? How long has this animal endured its second life? These are the questions that fill visitors’ minds when confronted with a taxidermy exhibits. This presents a challenge for museums seeking to continue to use these specimens to educate visitors about ecology, evolution, and biodiversity. That is the problem staff at the National Museum of Natural History took on when they set out to create a taxidermy hall for a contemporary audience. 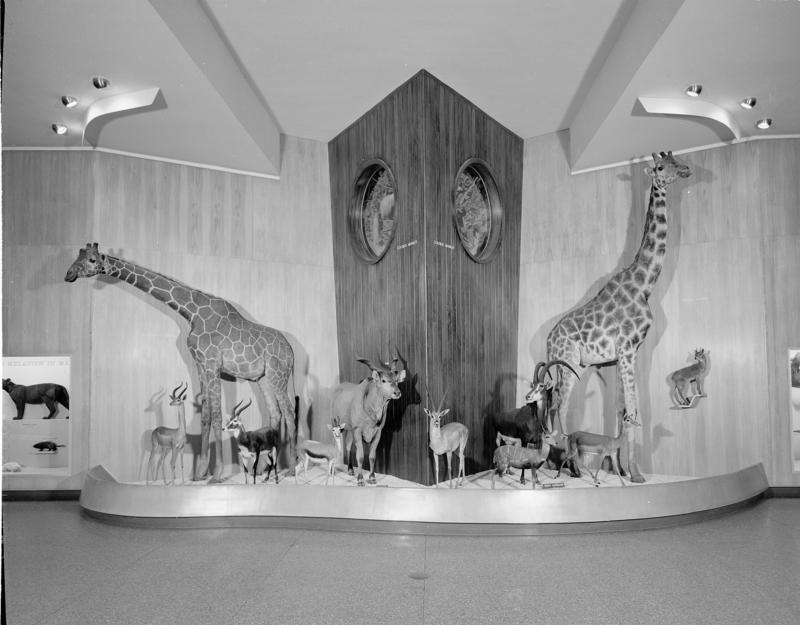 Like any century-old natural history museum, NMNH has a long history of taxidermy displays. Animal mounts filled the original United States National Museum and the Smithsonian’s various world’s fair exhibits. These specimens came from a variety of sources, including private donations and collecting expeditions by Smithsonian researchers. Several animals, such as the hippo mounted by William Brown, lived and eventually died at the National Zoo. Some of the museum’s most famous taxidermy mounts are the animals collected for the Smithsonian by Theodore Roosevelt’s expedition to Uganda, Kenya, and Sudan in 1909. Putting the Roosevelt specimens on display was a priority when building that is now NMNH opened in 1910. The prepared animals – including a family of lions, a giraffe, three northern white rhinos, and many others – filled an entire room in the new building’s west wing. 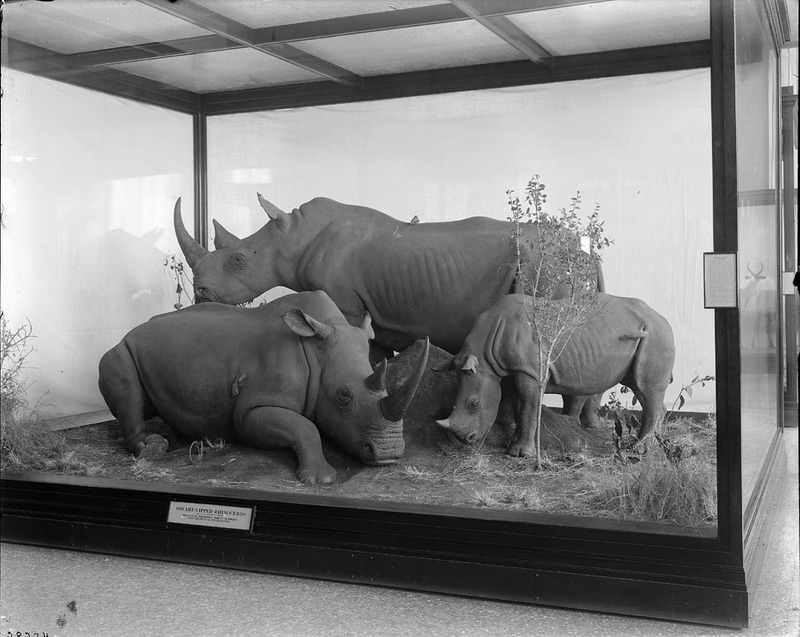 Northern white rhinos collected during the Roosevelt expedition, as displayed in 1915. Photo courtesy of the Smithsonian Institution Archives. African ungulates in the 1959 World of Mammals exhibit. Photo courtesy of the Smithsonian Institution Archives. By the mid-1990s, the modernized exhibits were looking a little rough around the edges. Many of the taxidermy pieces were over 80 years old, and the fur had become faded or frayed. The exhibit text was wordy and overly technical for the average museumgoer. 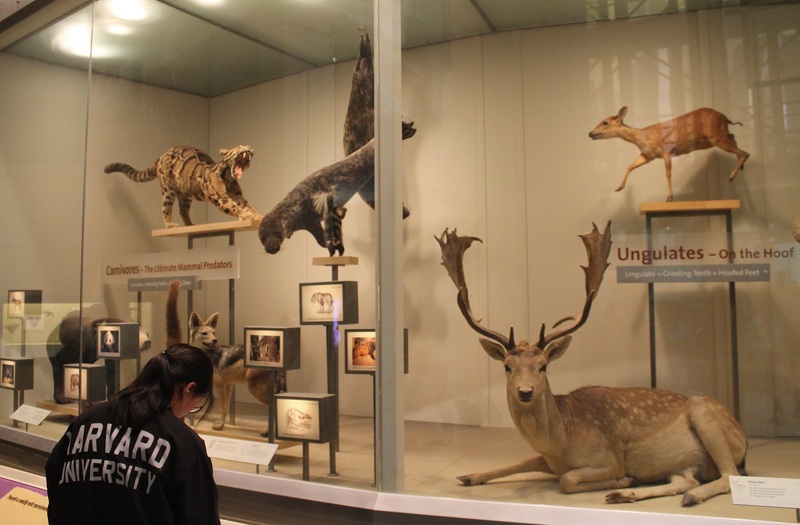 In 1998, the Smithsonian Institutional Studies Office underwent a detailed evaluation of the mammal exhibits, which involved interviewing hundreds of visitors about their reactions to the halls. Overall, visitors seemed satisfied with the exhibits, but the evaluation nevertheless provided a lot of useful information. The 1959 exhibits mixed complete dioramas with simpler cases covering specific topics. Photo courtesy of the Smithsonian Institution Archives. Although more than half of museum visitors passed through the mammal exhibits, it was seldom seen as the main attraction. For most visitors, the mammal halls were neither the first exhibit they saw, nor their favorite part of the museum. Older visitors tended to respond better to the mammal exhibits than children or teenagers, who saw the halls as old, boring, or creepy. Indeed, the yuck factor of the taxidermy and the specter of death in general was on many visitors’ minds. While they were often not comfortable talking about it, many visitors expressed concern about the fact that the animals on display were dead, and wondered about how they ended up that way. Out of 750 visitors, 11% were sad or uneasy about the taxidermy and 5% were outright disturbed. In 1997, California real estate developer Kenneth Behring donated $20 million to fund a new mammal hall at NMNH. At the time, this was the largest single donation the museum had ever received, and it presented an exciting opportunity. However, there was a conflict of interest: Behring was a big game hunter with a history of going after threatened species. For example, earlier that year Behring drew criticism from the Humane Society after killing a Kara-Tau argali (an endangered mountain sheep) in Kazakhstan. In a news release, Behring stated that he followed all applicable laws and always obtained proper permits, but many individuals – both within and outside the Smithsonian – were concerned that his hunting activities conflicted with the museum’s conservation-oriented mission. What’s more, Behring’s donation included 22 animals from his own collection, and the Smithsonian was accused of allowing him to buy his way into the institution’s prestigious exhibits. 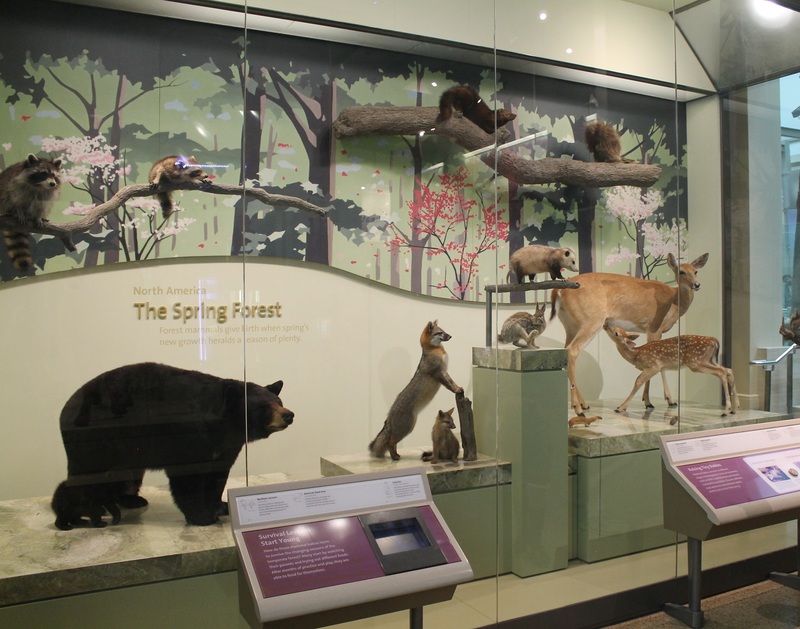 While the Kenneth E. Behring Family Hall of Mammals bears the donor’s name, and several of his personal trophies are on display, NMNH staff have made it very clear that Behring had no say in the exhibit’s message or content. That was just as well, because developing the exhibit internally proved plenty difficult. Pencils were allegedly thrown during meetings, and one conservator chose to retire rather than work on the new hall. Several individuals can rightly claim authorship of the Hall of Mammals, including Project Manager Sally Love and Writer Sharon Barry. However, the primary advocate for the hall’s striking and controversial design was Associate Director of Exhibits Robert “Sully” Sullivan. Sullivan envisioned a wide open hall, forgoing enclosed dioramas and instead displaying animals in simple settings with lots of negative space. The idea was to keep the focus on the animals, their anatomy, and their behavior. This steel-and-glass contemporary aesthetic has more in common with trendy tech showrooms than traditional taxidermy displays, and not everyone was initially on board. 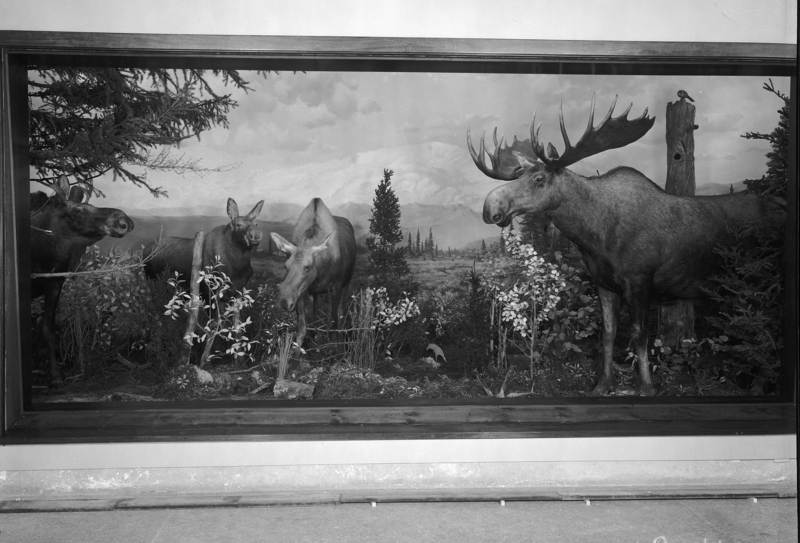 This Alaskan moose group was one of several dioramas dismantled to make way for the new Hall of Mammals. Photo courtesy of the Smithsonian Institution Archives. Unfortunately, the bold new vision could not be accomplished without destroying the old exhibits, including the historic dioramas. In the early 20th century, the proliferation of habitat dioramas radically transformed museums. Dioramas were accessible to broad audiences and brought with them the idea that museum exhibits should tell stories. These exhibits even had a tangible effect on the increasingly urban public’s interest in conservation. Today, historic museum dioramas are often considered quaint, but in their day they represented a bold fusion of art, technology, and science. According to Lawrence Heaney of the Field Museum of Natural History, the NMNH dioramas “were not particularly good.” They certainly didn’t hold up to the standard set by Karl Akeley, Robert Rockwell, and others at the American Museum of Natural History. Still, they were undoubtedly important historical artifacts and represented a huge amount of work on the part of the craftsmen who created them. After inspecting the exhibits, NMNH conservators reported that it would be possible to preserve the dioramas intact for some future use. However, top officials decided that this would be too expensive, and all of the dioramas were ultimately demolished. Some of the taxidermy mounts were cleaned up for the new exhibit, while others were passed on to other museums. Still others would up homeless, and were ultimately dismantled and harvested for parts. The minimalist watering hole in the Hall of Mammals. Photo by the author. While some traditionalists fretted about Sullivan’s push to eliminate the dioramas, he also made waves with his restructuring of the exhibit team. In the past, curators had primary authorship over exhibit content, but Sullivan wanted to democratize the process. He gave designers and educators a greater voice, and insisted that their specialized knowledge be heard. While many applauded the recognition Sullivan brought to professionals whose work was usually undervalued, others weren’t so sure. Research staff avoided exhibit work during Sullivan’s tenure because they felt they were being railroaded into plans that had already been made. It was a tense period, and for a time, there were no curators on the Hall of Mammals team. Fortunately, Curator of Vertebrate Paleontology Anna K. Behrensmeyer and senior mammal specialist (and former NMNH director) Robert Hoffman eventually stepped up as advisers for the Hall of Mammals. They brought to the table a phylogenetic approach that enhanced the strictly regional layout that had been planned for the exhibit. Phylogeny became a key theme once Behrensmeyer and Hoffman joined the exhibit team. Photo by the author. Yet another challenge emerged when the architectural firm NMNH hired to collaborate on the design restructured their staff midway through the project. No longer getting the results they wanted, NMNH hired a new firm – Reich+Petch Design International – to finish the job, at the cost of a multi-month delay. The new exhibit architects determined that the first draft simply had too much content. If all the planned displays were included, the Hall of Mammals would be very crowded and visitor traffic flow would be encumbered. The team confirmed this by laying out a mock-up of the floor plan on the National Mall. After walking through the space, the exhibit team decided to cut about 40% of the content and tighten up the interpretive themes. The hall’s final design is all about evolution, and our own place in the mammal family tree. With a plan in place, construction and fabrication were set to begin. We’ll cover that in the next post. Stay tuned! Institutional Studies Office. 1999. Examining Mammals: Three Studies of Visitor Responses to the Mammals Hall in the National Museum of Natural history. Washington, DC: Smithsonian Institution. I generally use this blog to write about other people’s work, but today I’m going to turn the tables and share a project I’ve been involved with for the past couple years. 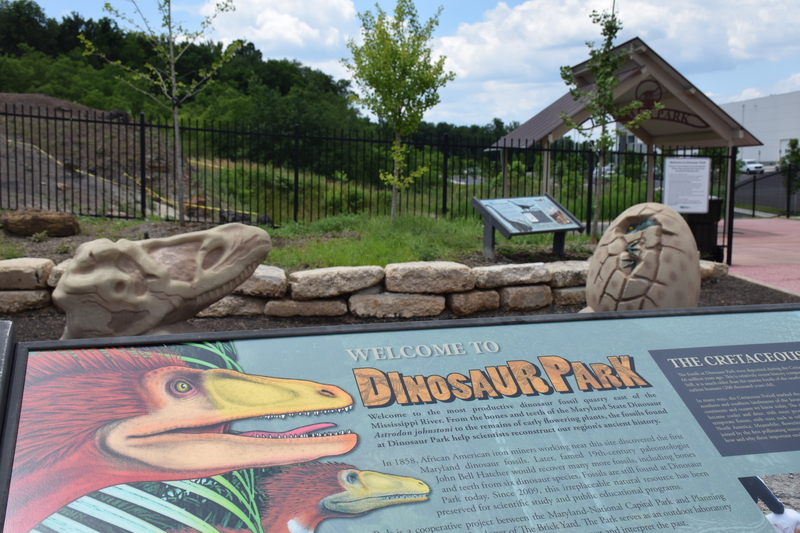 As of this month, the new interpretive area at Laurel, Maryland’s Dinosaur Park is (just about) complete. I’m proud of my own contributions, and ecstatic with all the work my immeasurably talented and dedicated colleagues have done to bring this project to fruition. Introductory sign at Dinosaur Park. Dinosaur Park is a 41-acre site operated by the Maryland-National Capital Park and Planning Commission that preserves the most productive dinosaur fossil quarry in the eastern United States. Historically known as the Muirkirk quarry, this location has been a known source of dinosaur material since 1858. Fossils were first discovered by ironworkers collecting siderite for processing at the nearby Muirkirk ironworks. Later, O.C. Marsh, John Bell Hatcher, Charles Gilmore, Richard Lull and other prominent paleontologists would collect or study fossils from this deposit. The site was largely forgotten for most of the 20th century, but in the 1980s Peter Kranz, Tom Lipka, and others relocated it and began unearthing new material. Highlights included a massive sauropod femur, basal ceratopsian teeth, and the only Mesozoic mammal fossils ever found east of the Mississippi River. The Muirkirk quarry produced some of the first dinosaur fossils to be scientifically studied in North America, and as such conceptions of its position in geologic time have understandably changed over the years. Marsh assumed the site was Jurassic in age because of the presence of sauropods, but Gilmore later revised it to Cretaceous. Based on pollen data, we can now place the site (and the Patuxant Formation as a whole) at the Aptian-Albian boundary in the Lower Cretaceous. 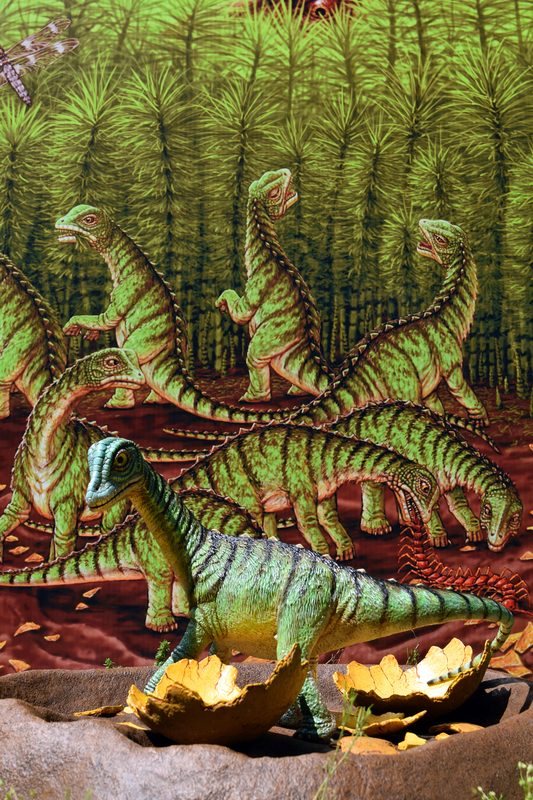 Contrary to older proposals, the Muirkirk dinosaur fauna has more in common with the middle strata of the Cedar Mountain Formation in Utah than the Wealden Group in England. 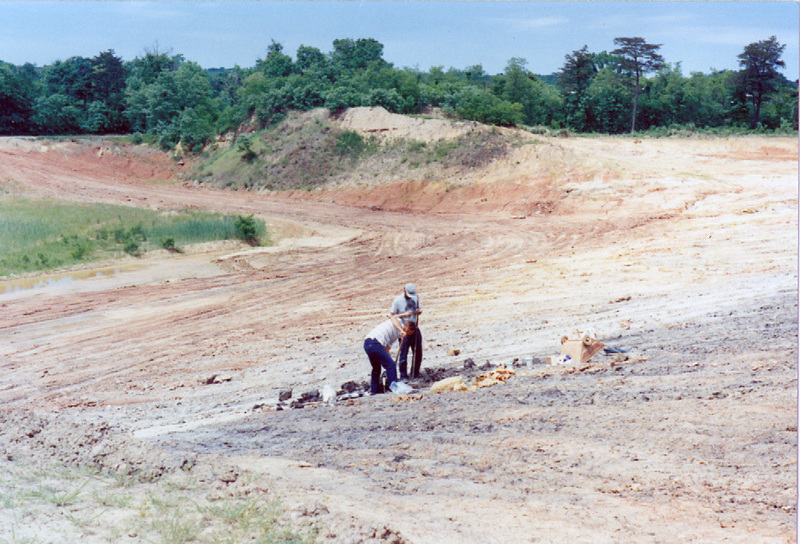 Excavating a sauropod femur at the future site of Dinosaur Park in 1991. Photo courtesy of Pete Kroehler. Dinosaur Park fossils aren’t much to look at, but they are remarkable for their diversity. This is a record of a complete ecosystem. 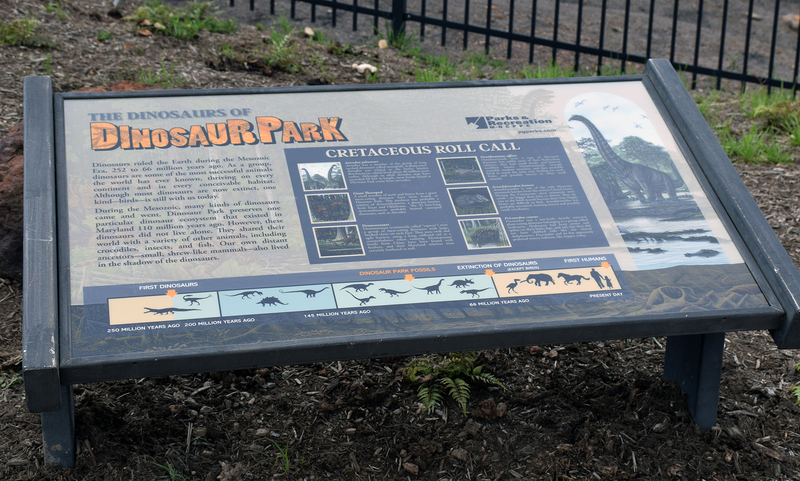 Thanks to some determined lobbying, the M-NCPPC (a bi-county organization that administers parks and urban planning) acquired the Muirkirk site and formally dedicated Dinosaur Park in October 2008. From its inception, Dinosaur Park was conceived as a citizen science project. During school programs and regularly scheduled open houses, visitors are invited to take part in ongoing prospecting for fossils. These programs emphasize stewardship of natural heritage, rather than treasure hunting, and to date visitors have discovered thousands of specimens. All of these fossils are accessioned into the county’s collection for research and education, and important specimens are turned over to the National Museum of Natural History for final curation (search the NMNH Paleobiology collections database for “Arundel” to view this material). 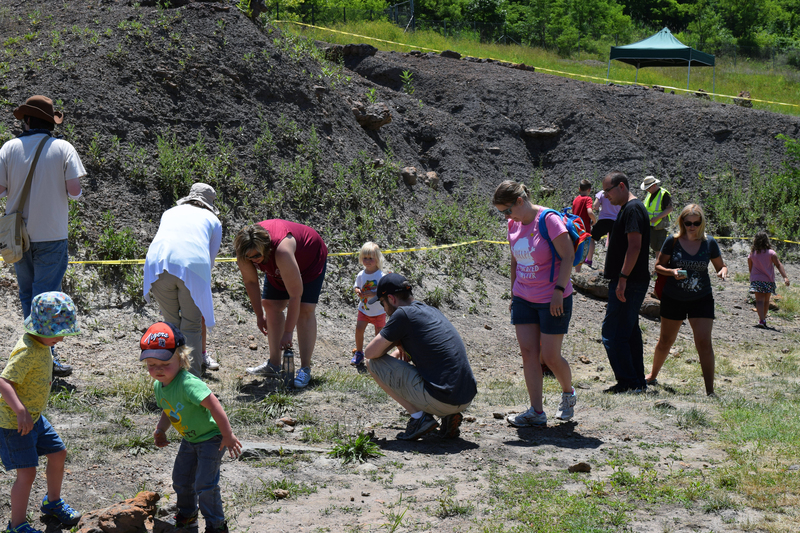 Citizen scientists prospecting for fossils at Dinosaur Park. Back in 2008, there wasn’t much to Dinosaur Park beyond the fossil site, a protective fence, and a small gravel parking lot. There were always plans to further develop the site, however, and thanks to the Park’s ongoing popularity we were able to kick off the phase II construction in 2016. The project involved developing the entrance area with exhibits and visitor amenities. There wasn’t a lot of space to work with, and the new facilities would have to do double duty: they needed to be useful both during guided programs and for drop-in visitors during the week (when the fossil site is closed). We ended up with an integrated, multipurpose space incorporating a series of exhibit signs, a garden of “living fossil” plants, a presentation area, a climbable dinosaur skeleton, two picnic benches, and a restroom and drinking fountain. A number of additions were – to the probable annoyance of my colleagues – the result of me piping up with a last-minute “wouldn’t it be cool if…” suggestion. That’s how we ended up with a life-sized image of the Astrodon femur discovered by the Norden family in 1991, a trail of sauropod footprints, and a series of displays about baby sauropods (perhaps there’s a theme there?). The garden, play area, and other new facilities at Dinosaur Park. One of several new interpretive signs. The content of the exhibit signs was directly informed by formal and informal visitor surveys. We took note of visitors’ most frequent questions, as well as which parts of our old displays were being ignored or misunderstood. For example, lots of visitors wanted to know about the biggest or most important fossils found at the Park. These weren’t illustrated on our old signs, but they’re integral parts of the new ones. Meanwhile, very few visitors were engaging with content about local geology, so those sections ended up being cut. A section of Shoe’s masterful Cretaceous Maryland mural. Artwork by Clarence Schumaker, courtesy of the M-NCPPC. For me, and hopefully many visitors, the highlight of the new displays is the spectacular mural created by Clarence “Shoe” Schumaker. Shoe has produced artwork for numerous parks and museums, including several National Park Service facilities, but to my knowledge he had never painted dinosaurs before. Nevertheless, he approached the project with unquenchable enthusiasm, determined to get every detail correct. Working with Shoe was a fantastic experience – I would send him my hasty sketches and random ideas and he would somehow turn them into spectacular imagery. Our goal was to produce an image that would be at home in any nature center. This is an overview of an ecosystem, and the presence of dinosaurs is only by happenstance. The final piece is mesmerizing, and I think its hyper-detailed placidity gives it a certain Zallinger-like quality. The finished mural was so cool that I couldn’t help but ask for more. One under-reported virtue of the Dinosaur Park collection is that we have sauropod remains from a variety of ages and sizes – from 70-foot adults to tiny hatchlings. I suggested a single image of a baby sauropod to help illustrate these animals’ remarkable growth potential. Shoe turned around and produced two full paintings and a life-sized model. The man is seriously unstoppable. Shoe’s 2D and 3D baby Astrodon art. Artwork by Clarence Schumaker, courtesy of the M-NCPPC. It’s been a wonderful experience seeing the Dinosaur Park interpretive area come together, and the few places where compromises were made are vastly overshadowed by the many prominent successes. Dinosaur Park is an important resource, both for growing our knowledge of prehistory and for introducing the local community to the process of scientific discovery. I can’t wait to see it continue to grow! Extinct Monsters is a blog about the history and artistry of paleontology in museums. Museum admission, archive visits, travel, and so forth can be expensive. If you can, please consider supporting this blog by leaving a tip. Any amount is appreciated!